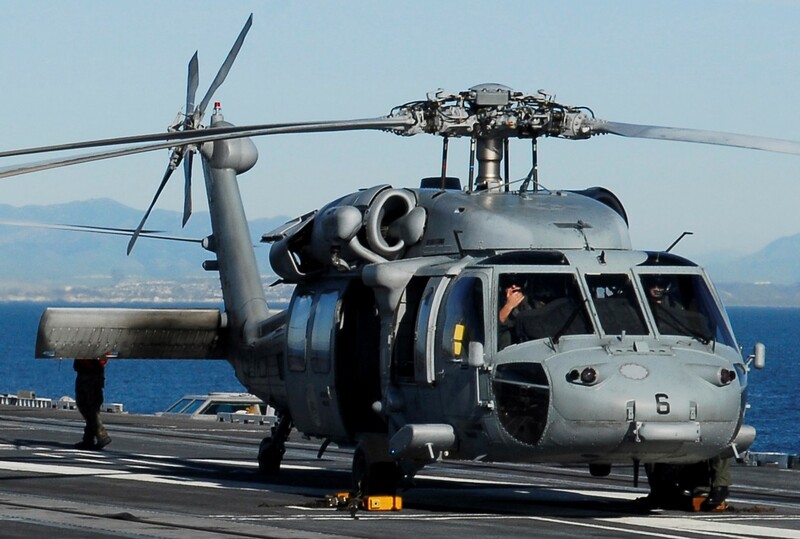 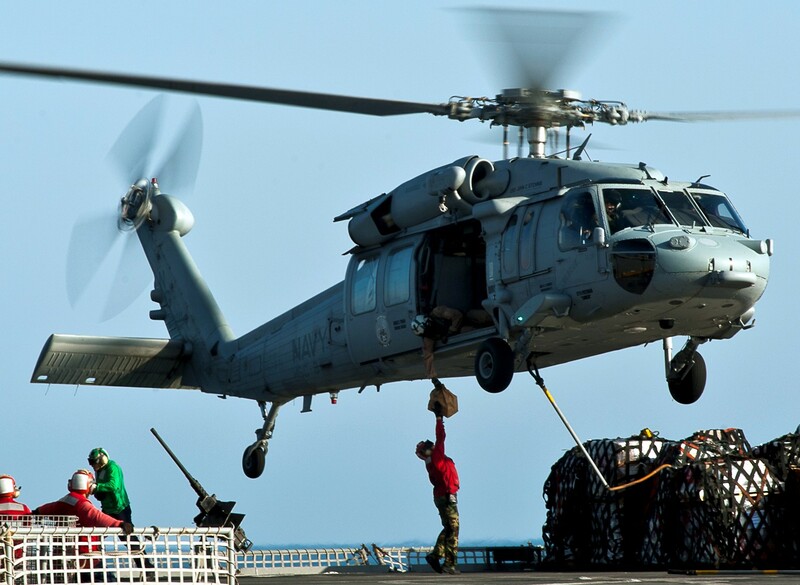 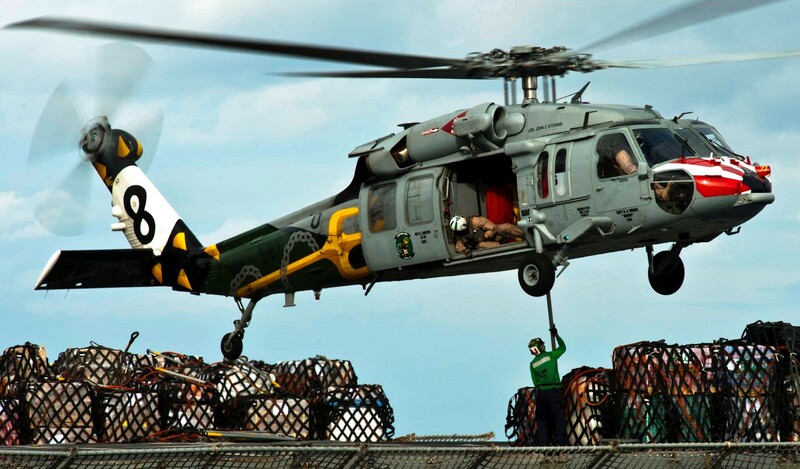 Helicopter Sea Combat Squadron Eight (HSC-8) "Eightballers" is a United States Navy helicopter squadron based at Naval Air Station North Island, San Diego, California. 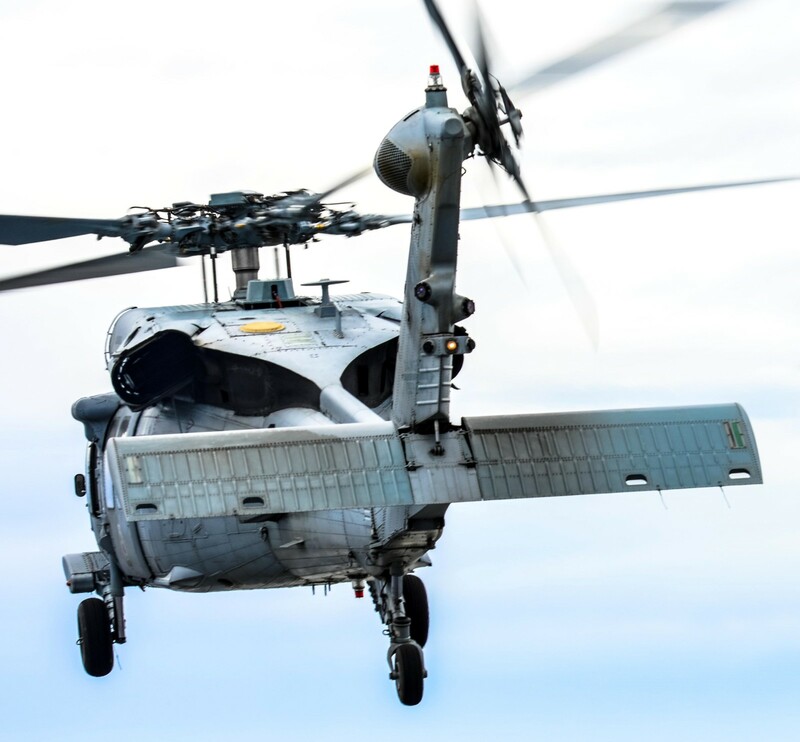 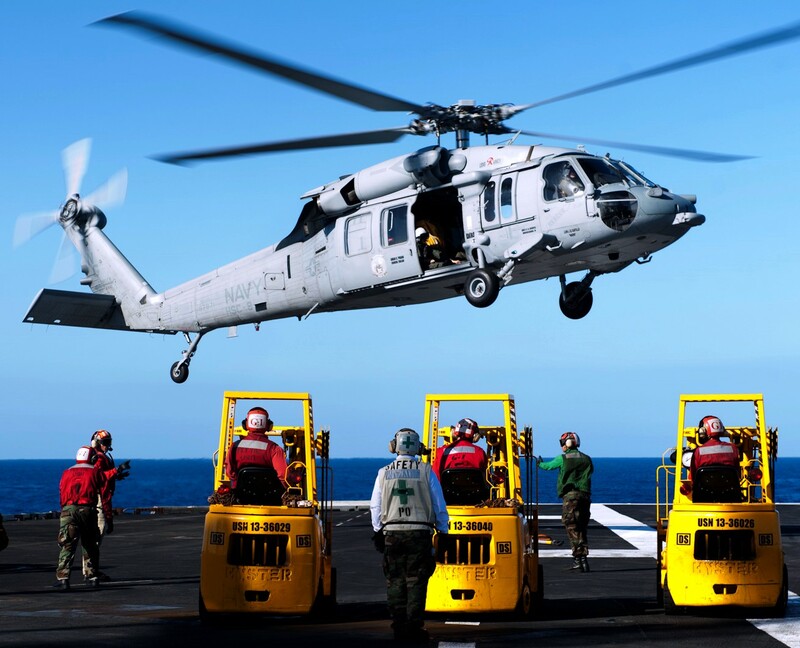 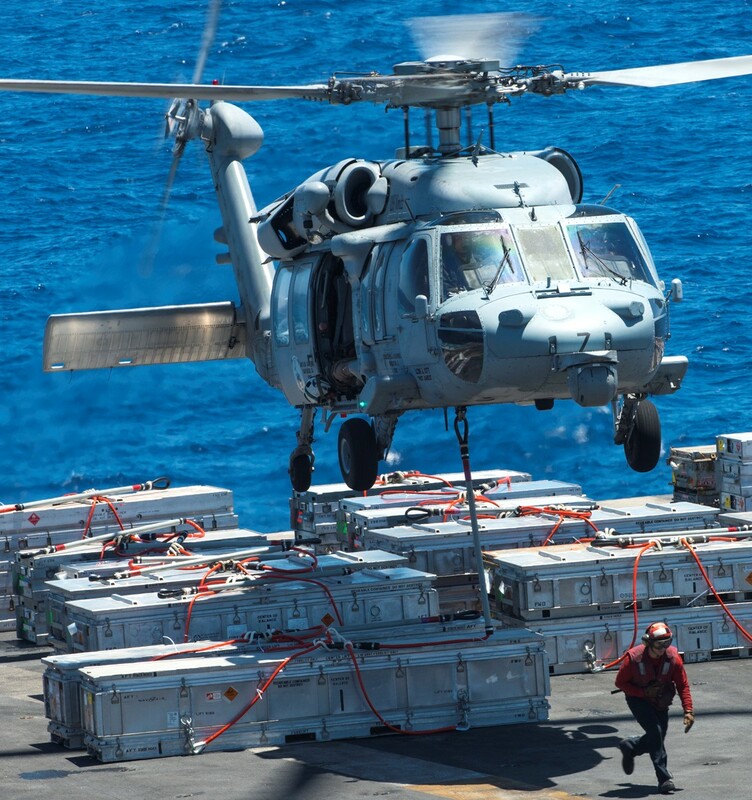 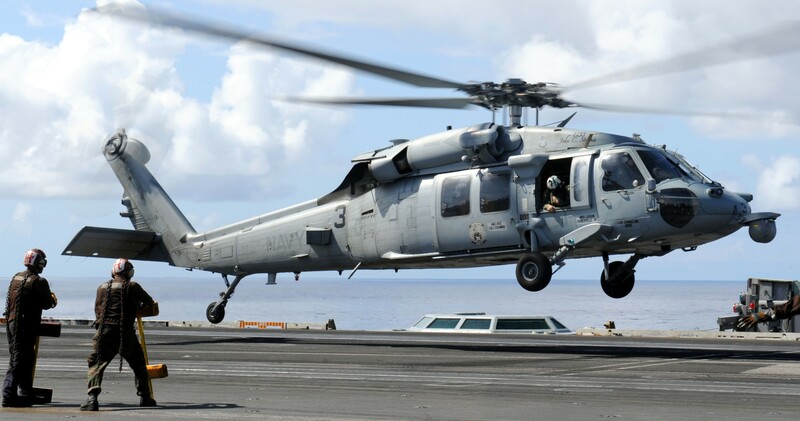 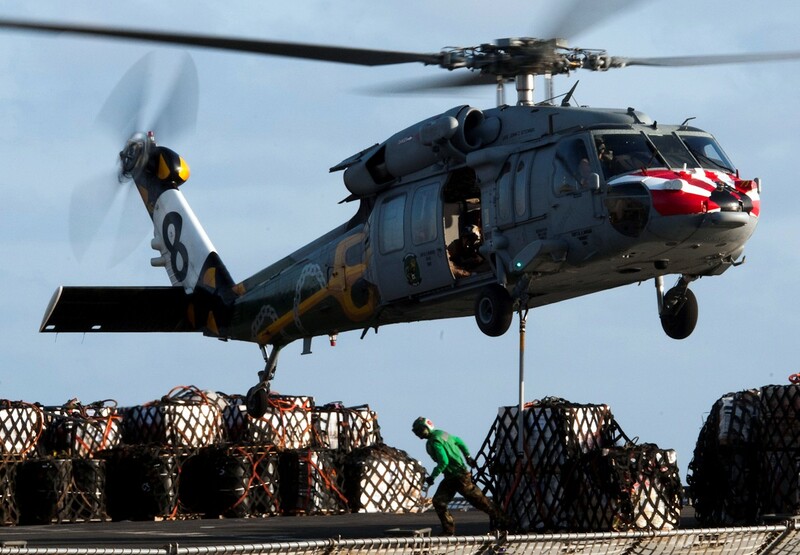 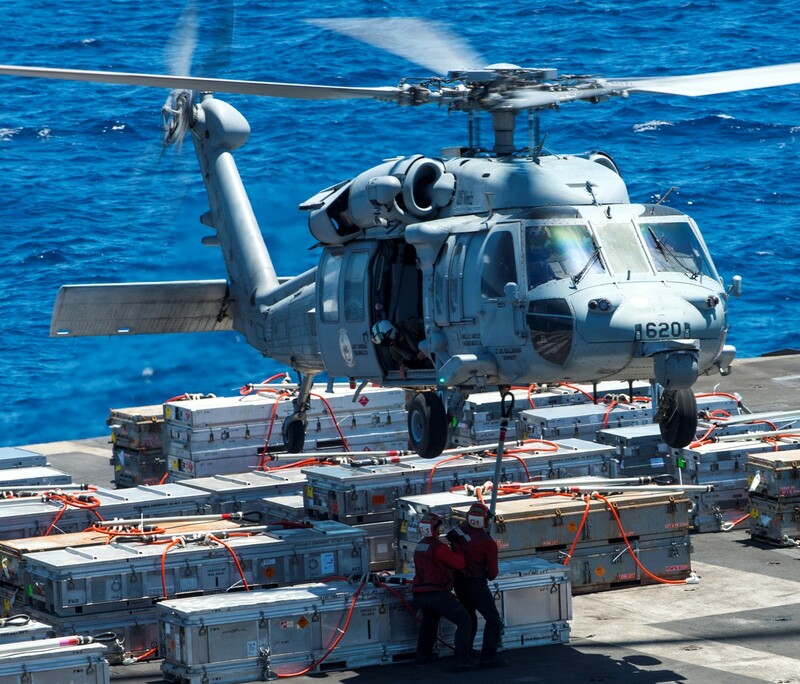 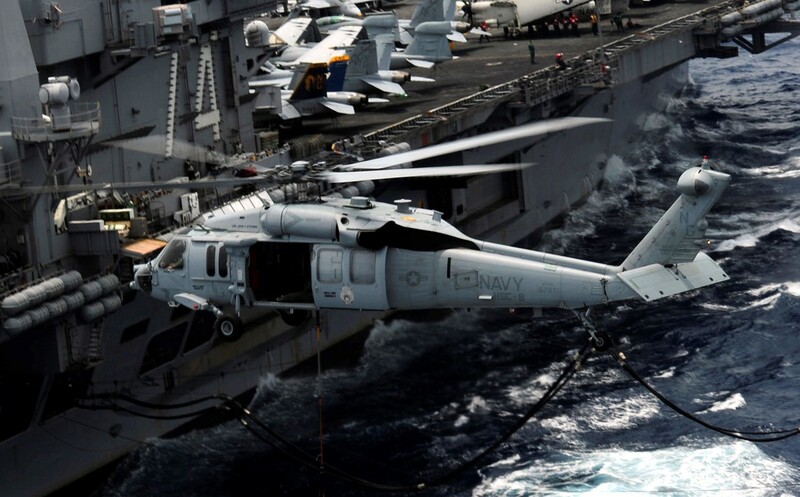 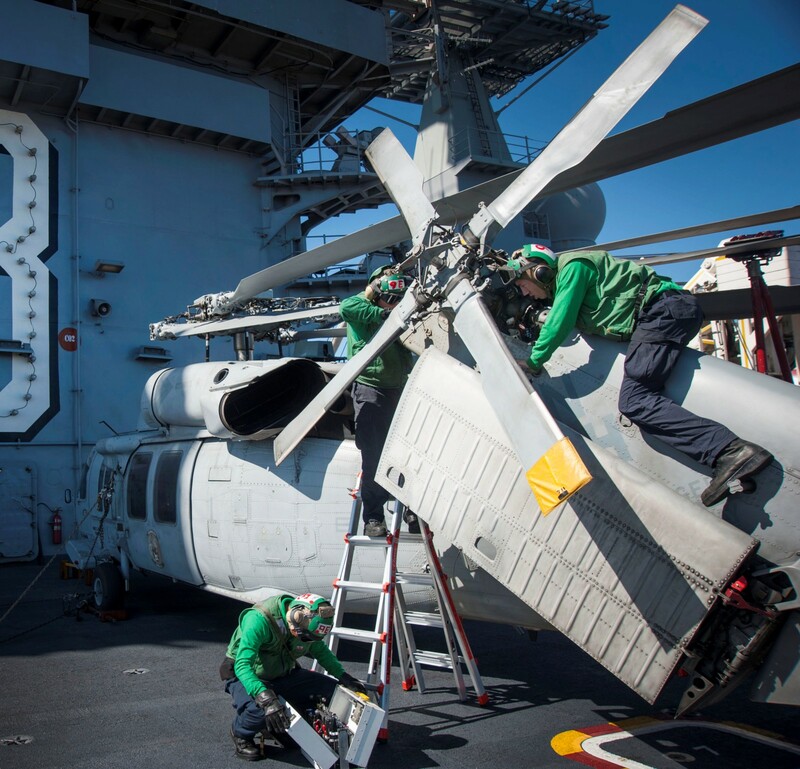 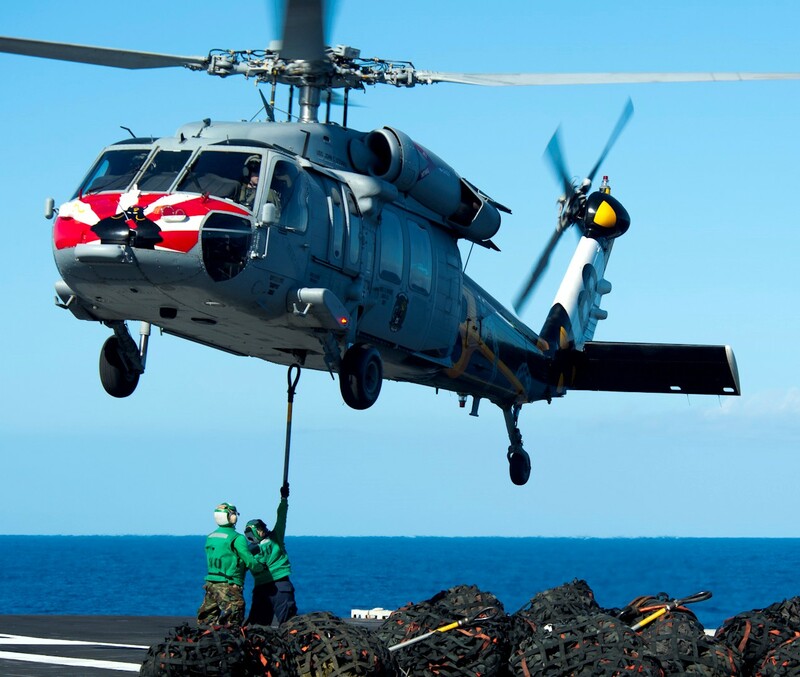 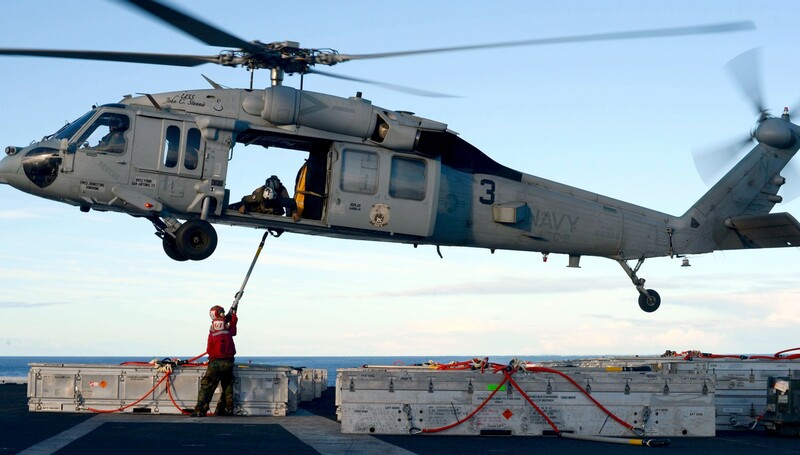 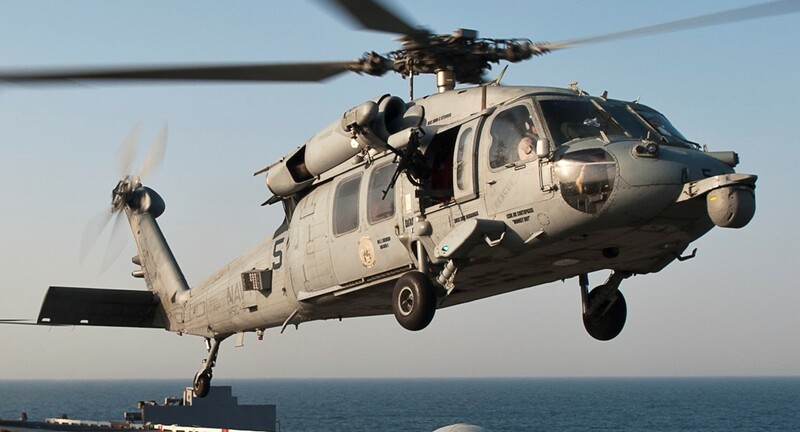 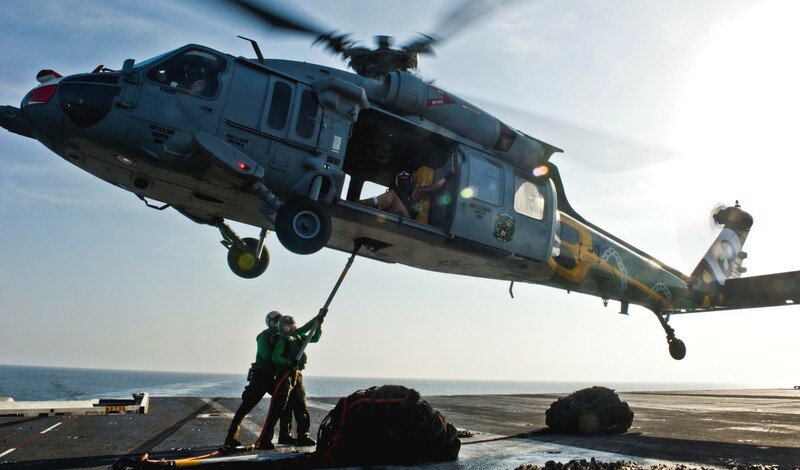 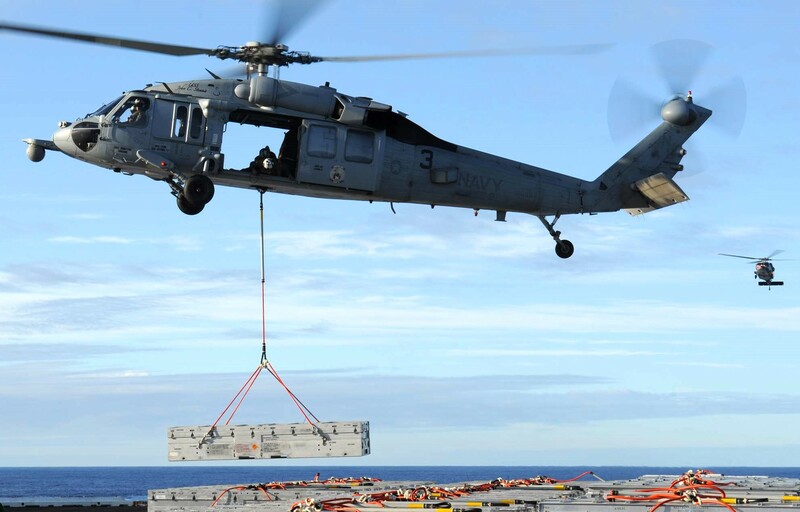 HSC-8 is attached to Carrier Air Wing Nine (CVW-9) and deploys aboard USS JOHN C. STENNIS (CVN-74). 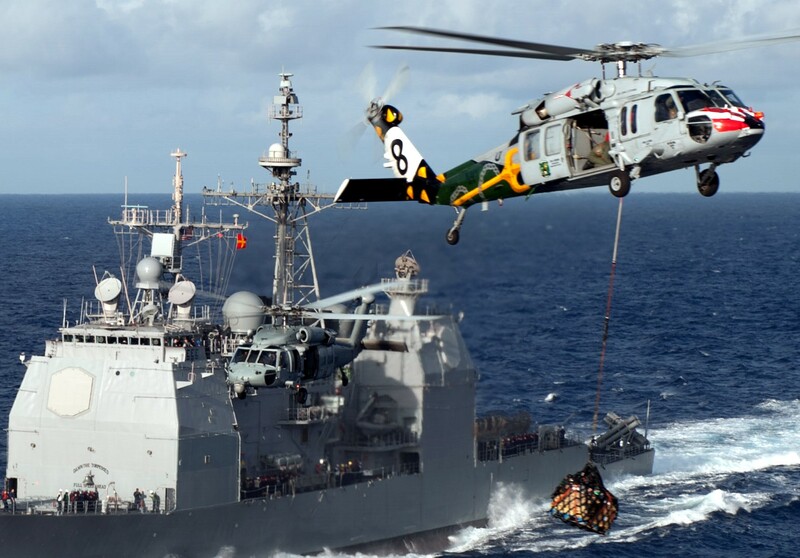 HSC-8 was redesignated from HS-8 on 28 September 2007. 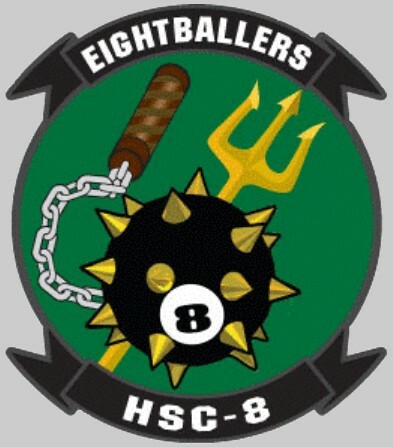 The original HS-8 was established at Naval Auxiliary Air Station Ream Field, Imperial Beach, California on June 1, 1956. 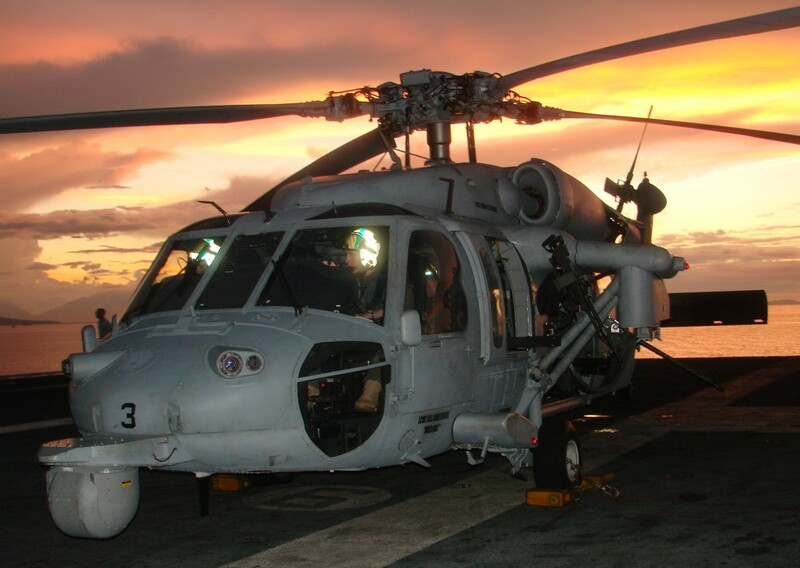 The first helicopters employed by the command were the HSS-1 (H-34) Sea Bat. 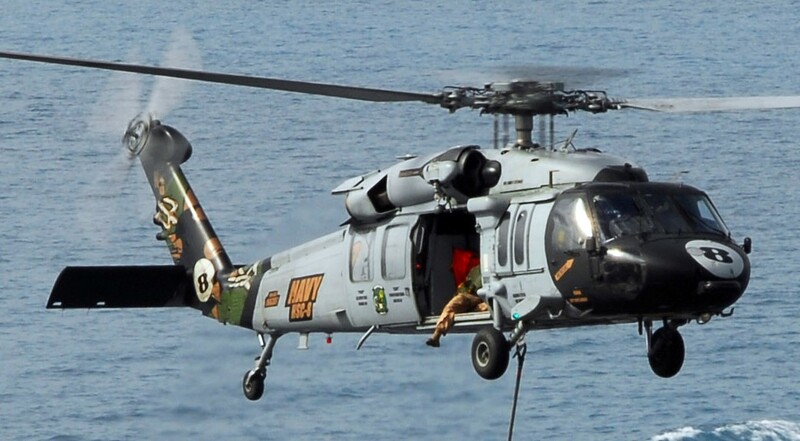 The squadron performed eight Western Pacific (WESTPAC) deployments between 1957 and 1968 including combat tours in Vietnam. 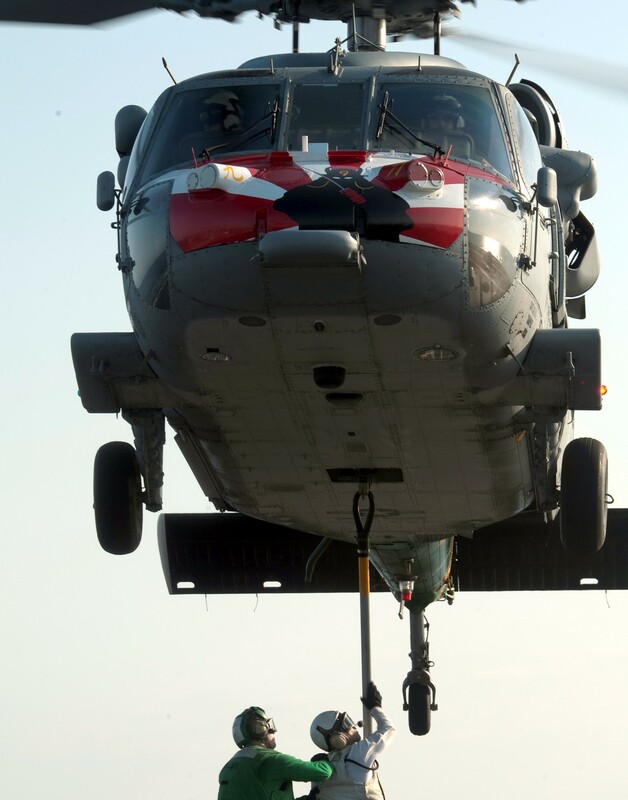 Notable achievements included a 1,200 mile medical evacuation (MEDEVAC) made by helicopter, the longest in history. 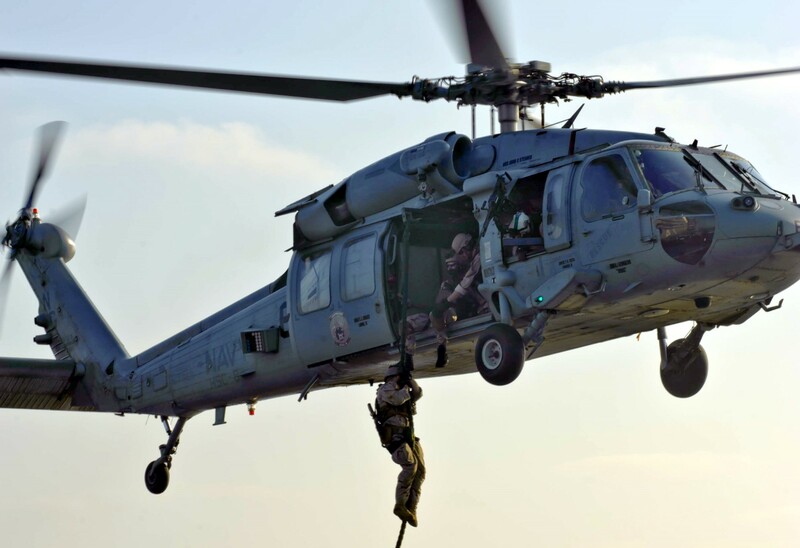 Other squadron achievements included participation in the Apollo VI space vehicle/crew recovery and performing more than 30 Combat Search and Rescue missions in North Vietnam. 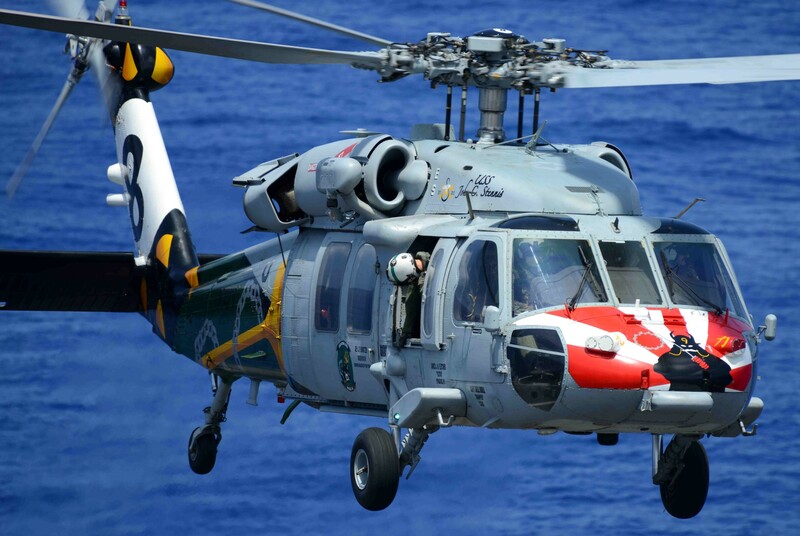 The squadron was decommissioned in November 1968 only to be recommissioned a year later on November 1, 1969. 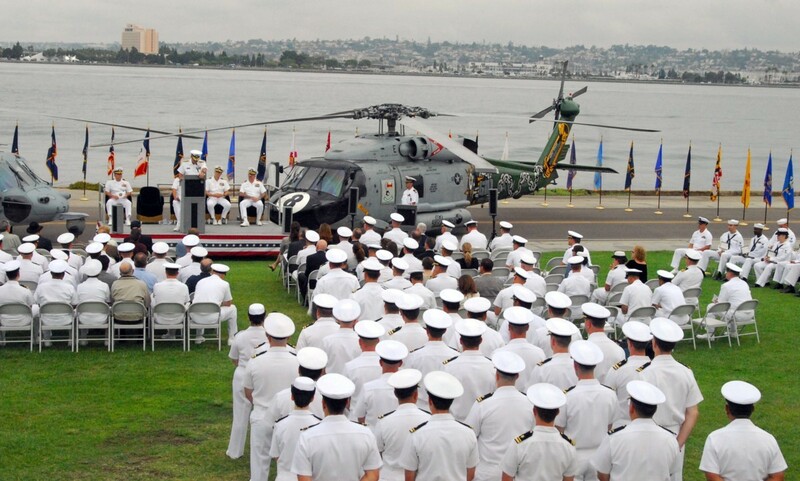 Although the Navy does not officially recognize lineage between the two squadrons, the newly established squadron resumed the insignia and traditions of the former squadron. 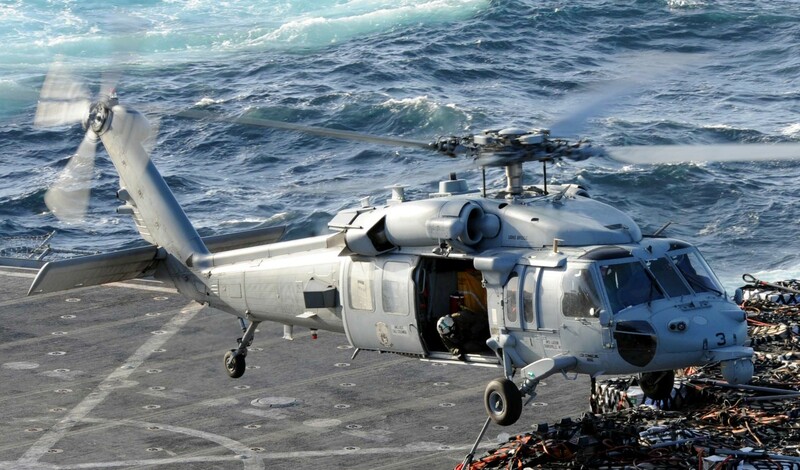 With the new commissioning came new helicopters, namely the SH-3D. 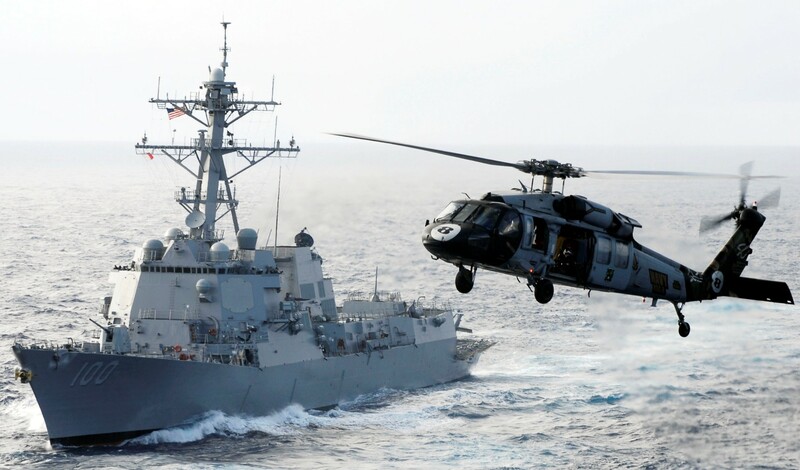 Notable achievements during the next decade included site surveys for the U.S. Atomic Energy Commission, a study of blue whale migration patterns, supporting President Nixon during his working vacation aboard the USS New Orleans and deploying in response to the Iranian hostage crisis. 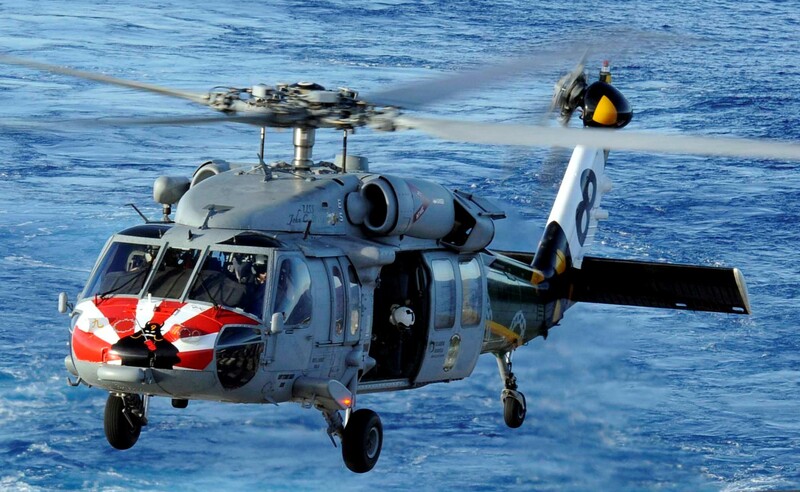 In 1976 the American Bicentennial Committee honored HS-8 as a bicentennial command. 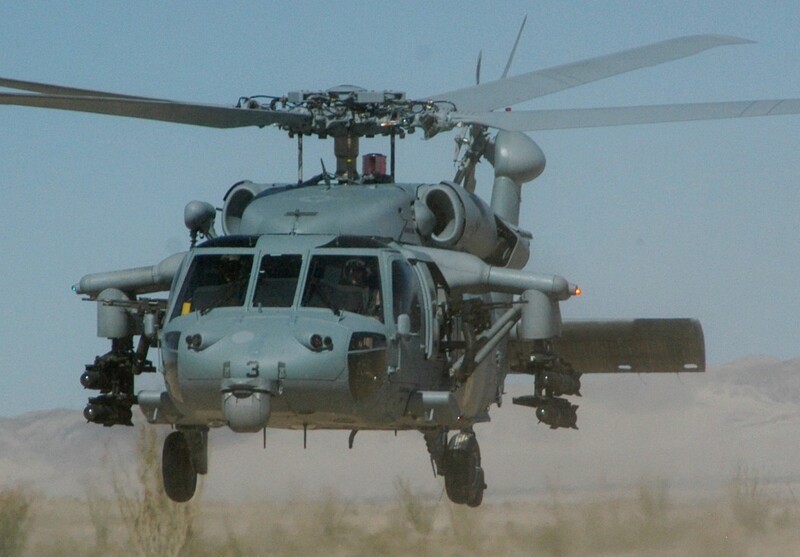 The squadron's 19th deployment came in response to Desert Shield/Desert Storm in December 1990. 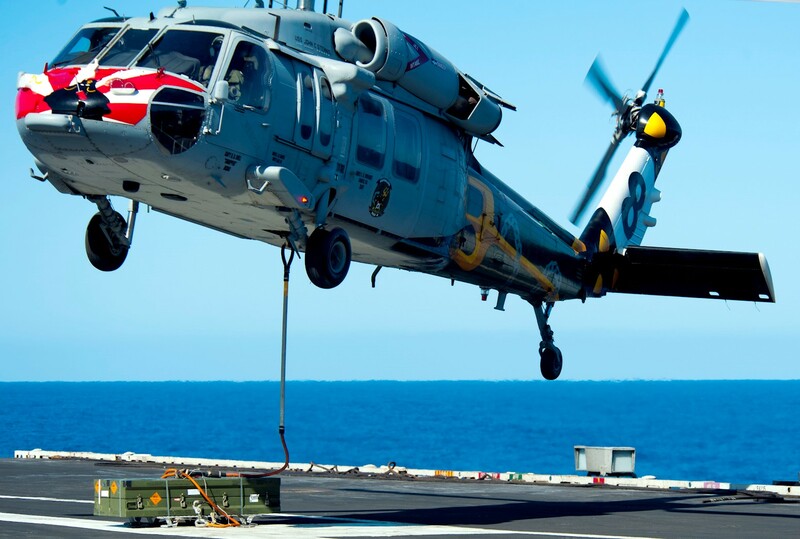 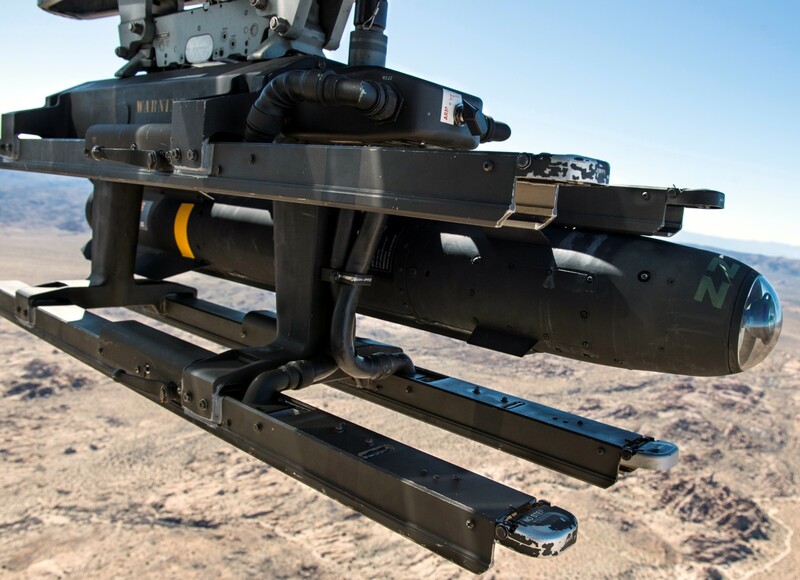 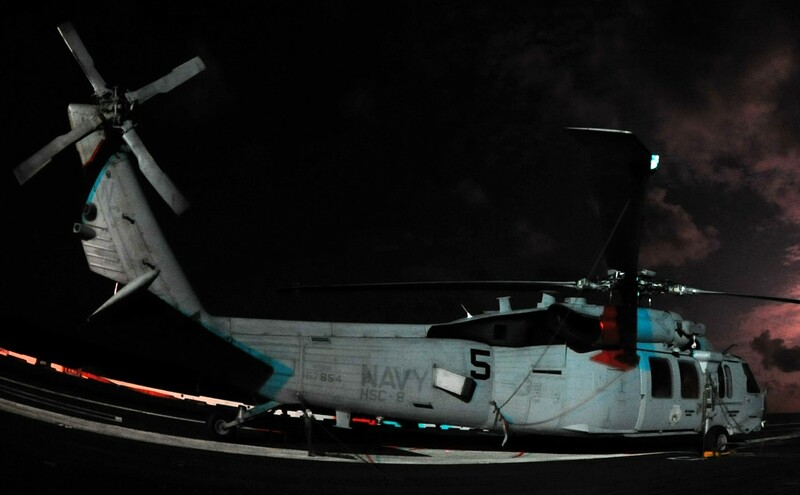 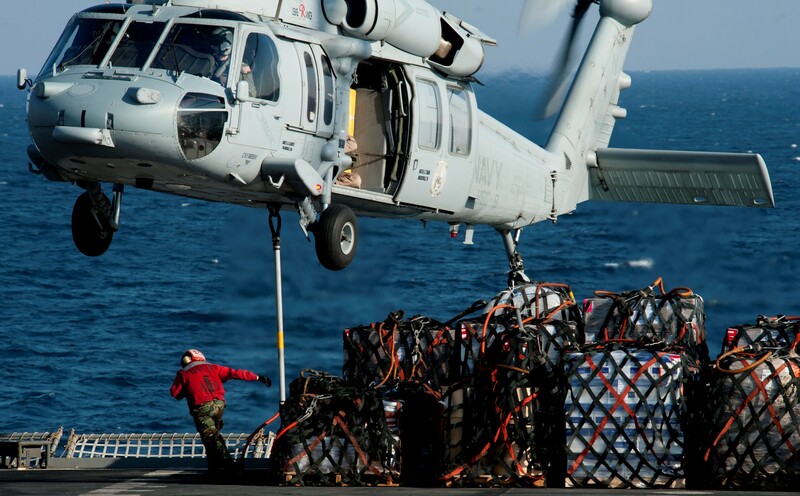 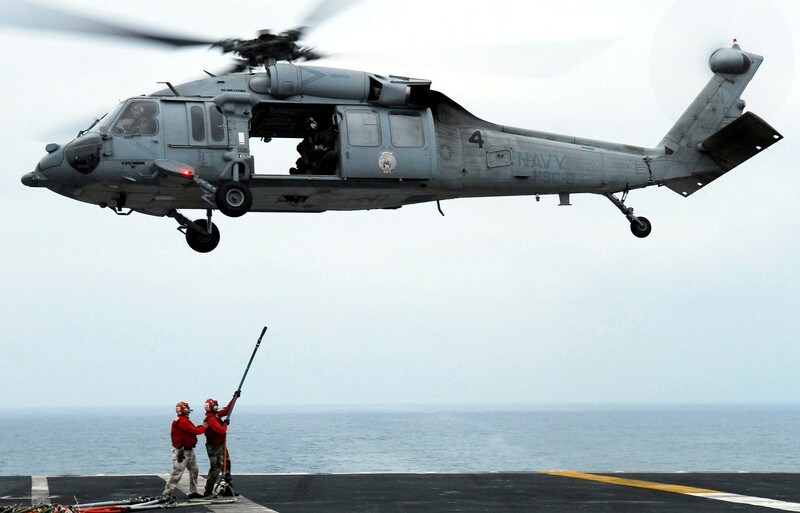 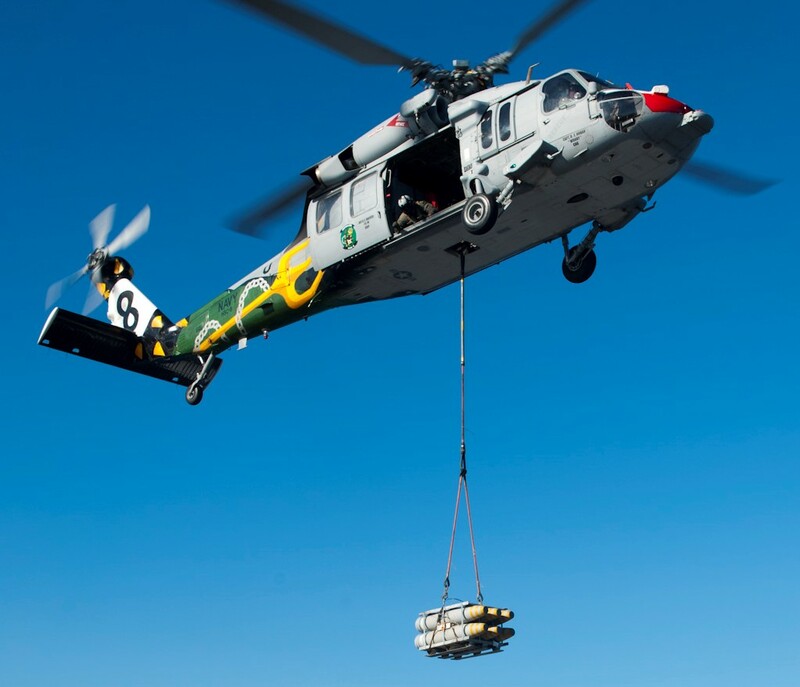 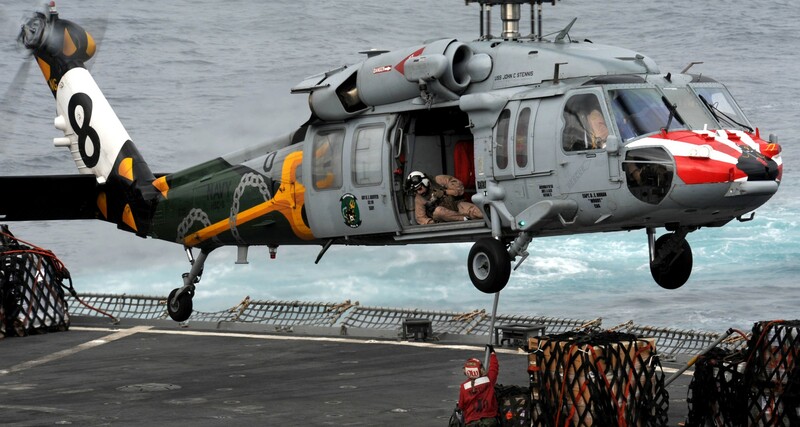 This deployment was the last for HS-8 in the SH-3. 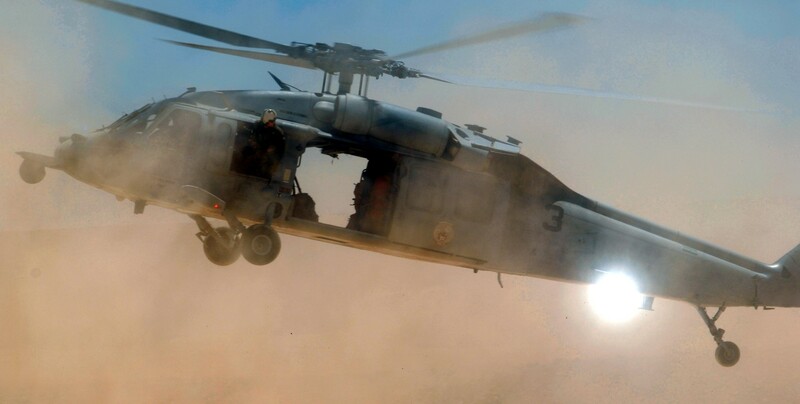 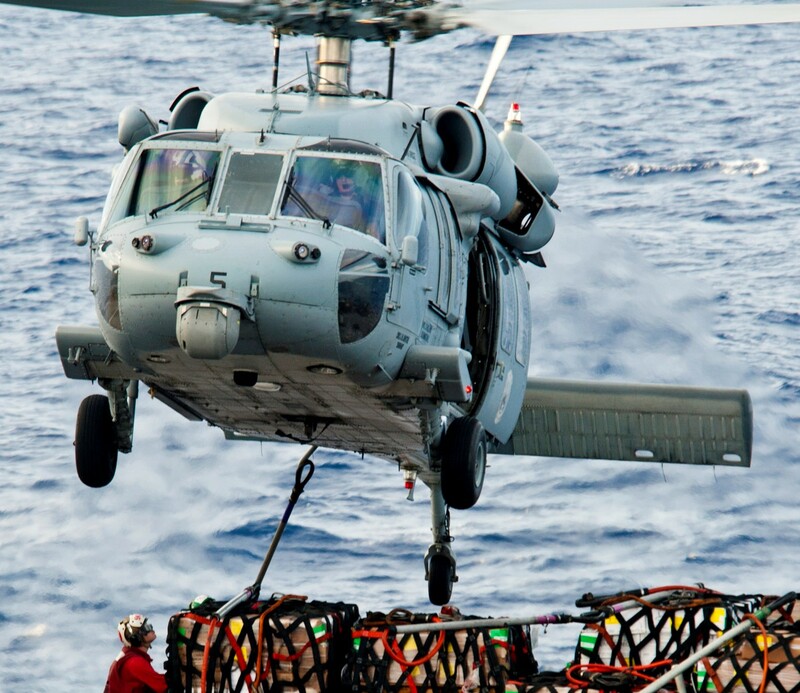 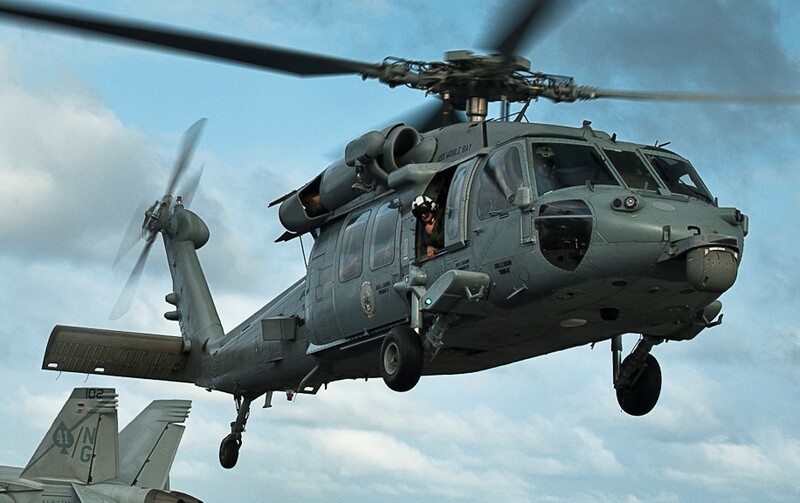 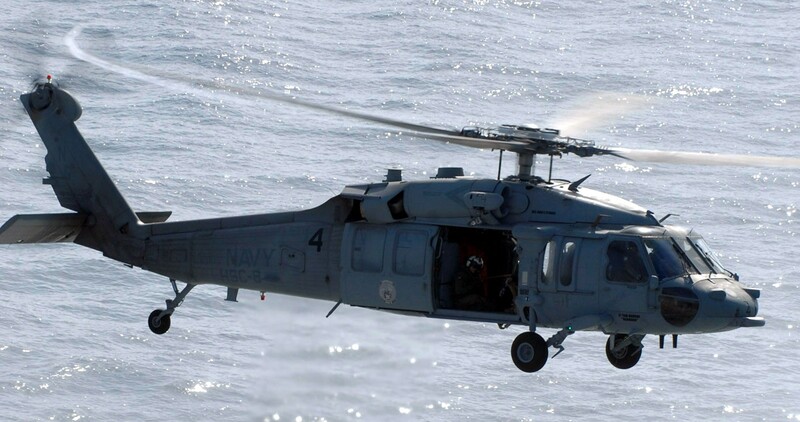 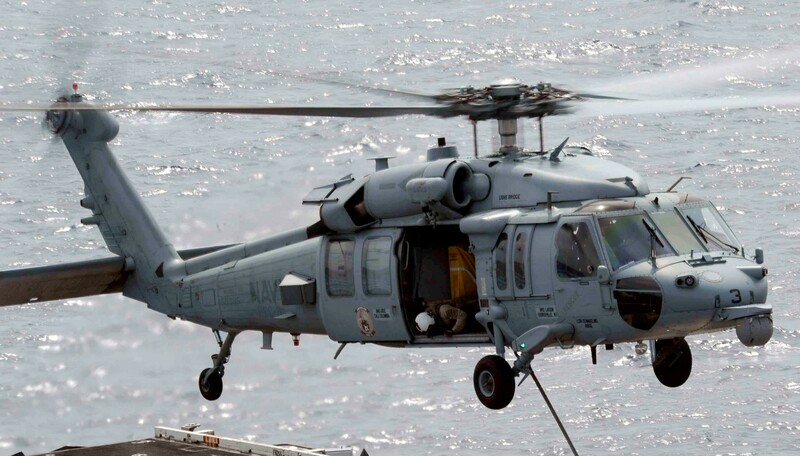 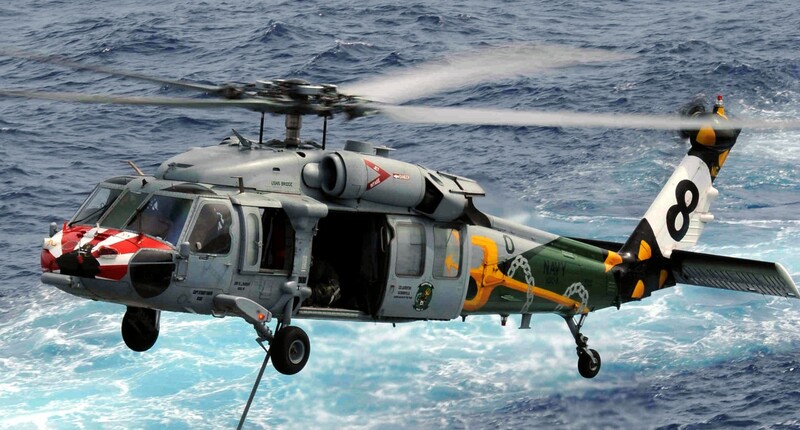 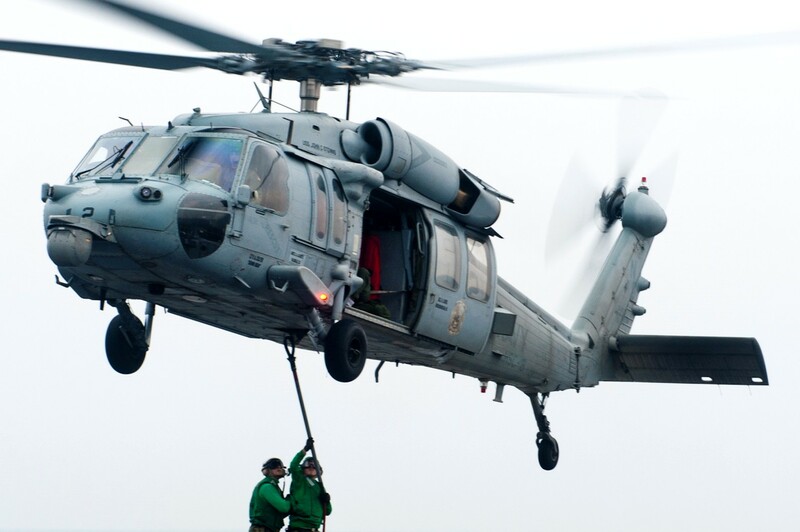 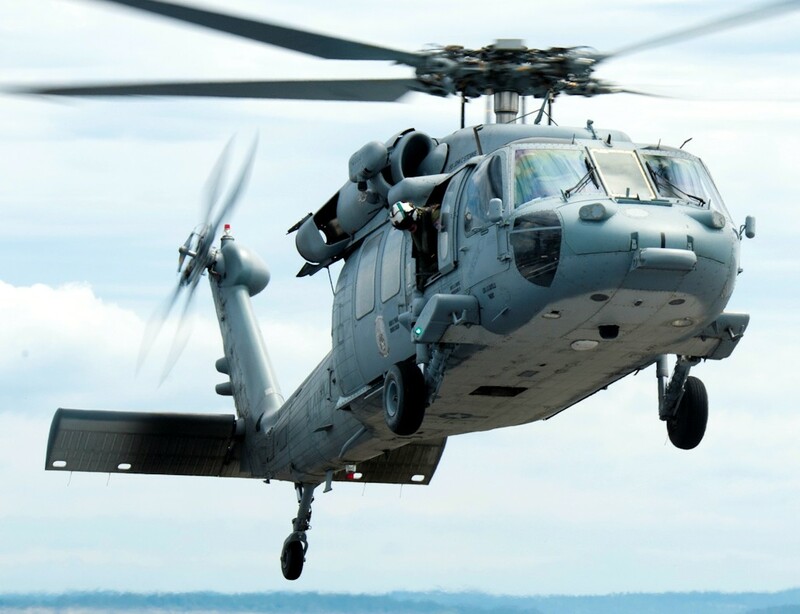 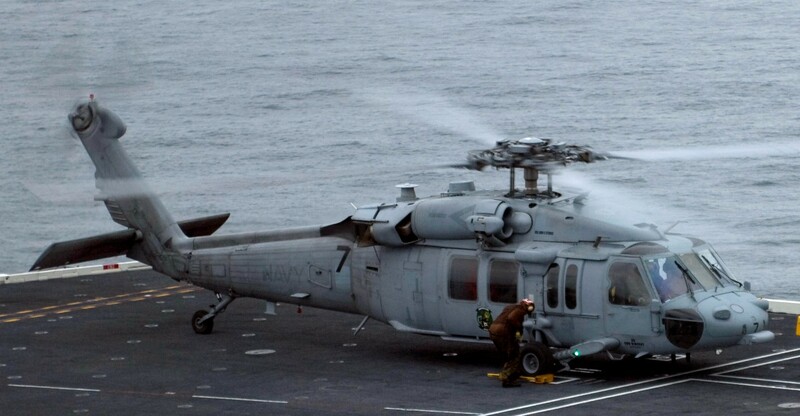 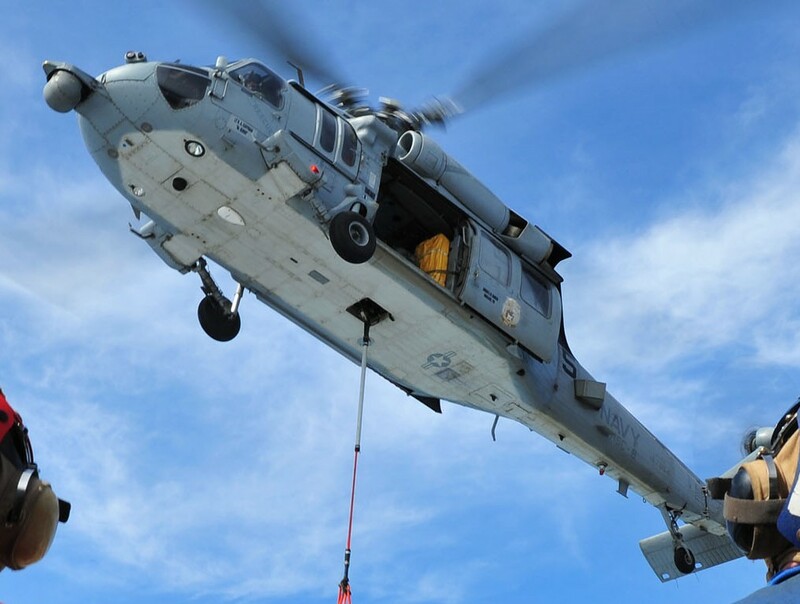 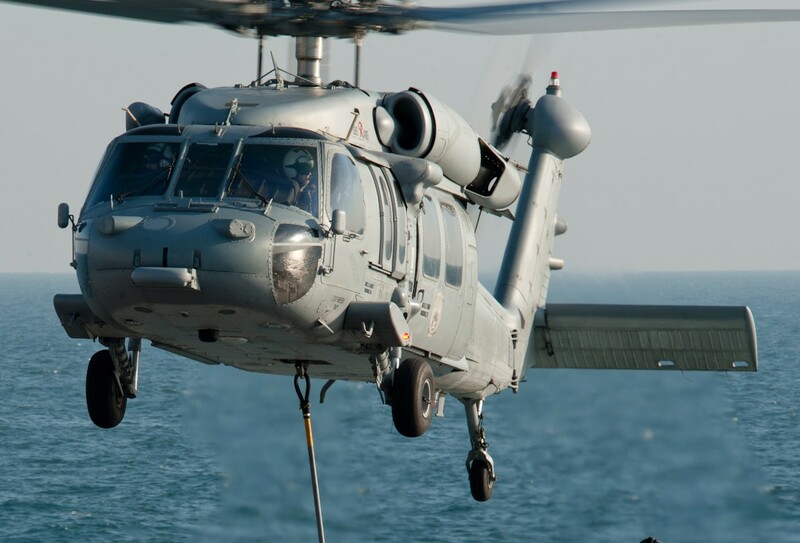 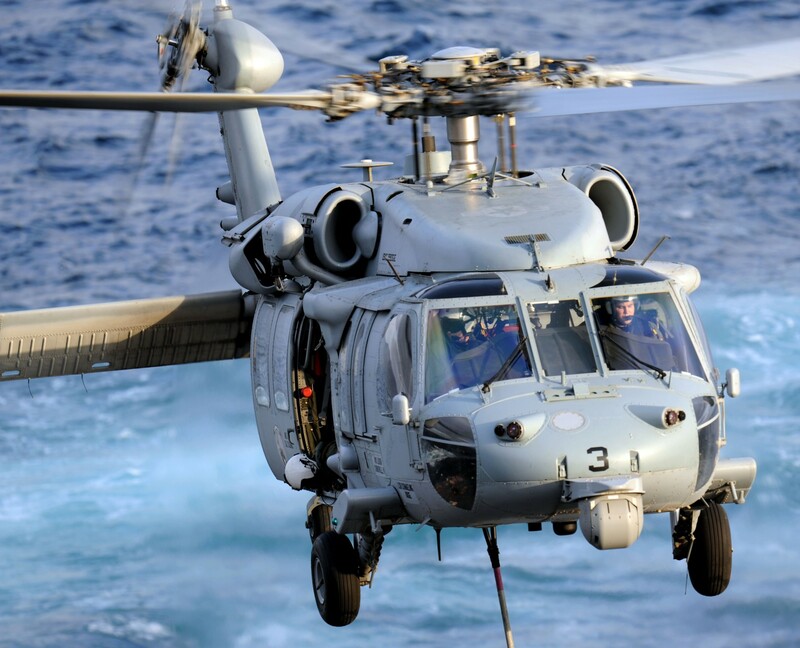 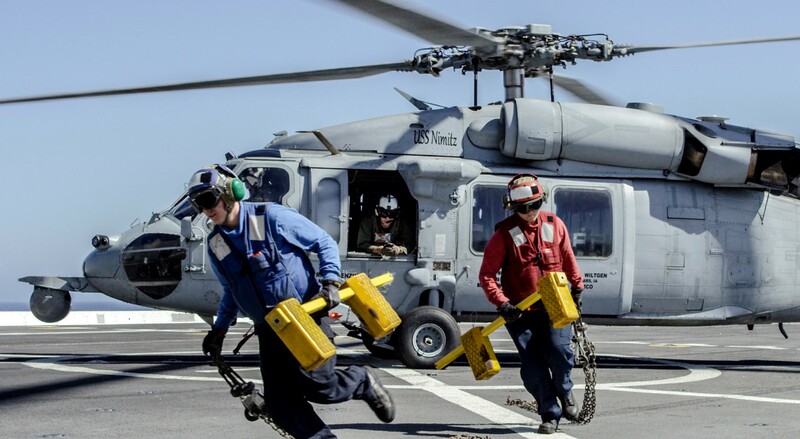 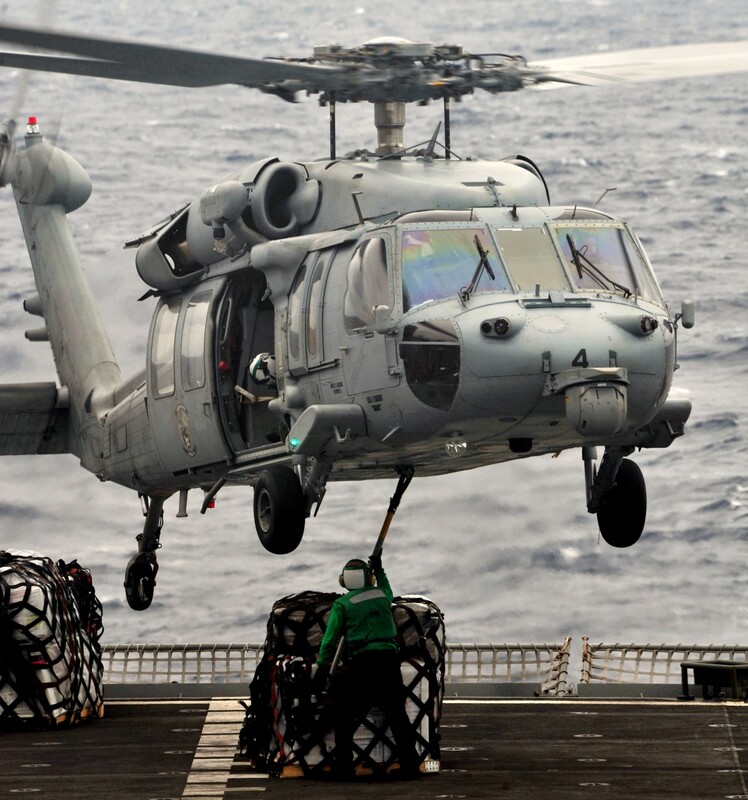 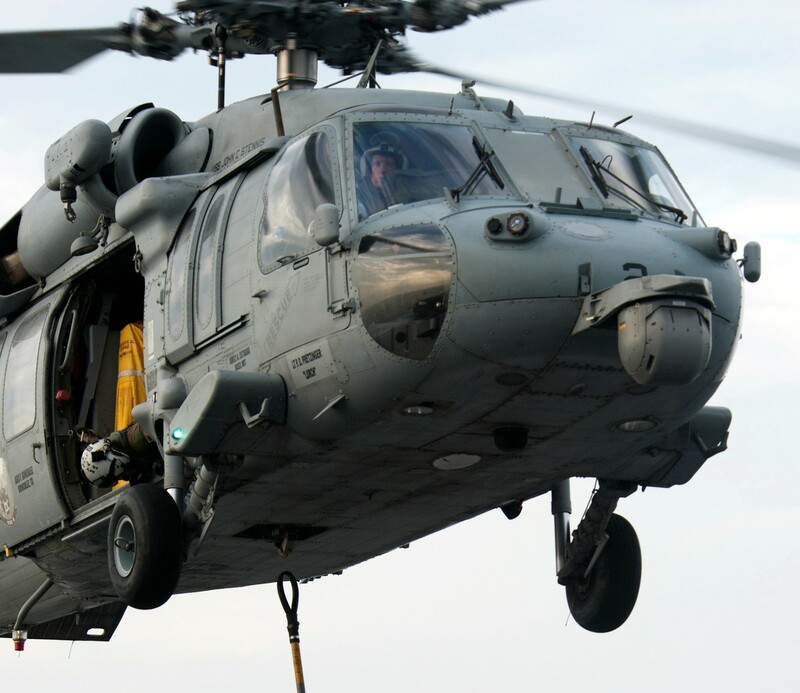 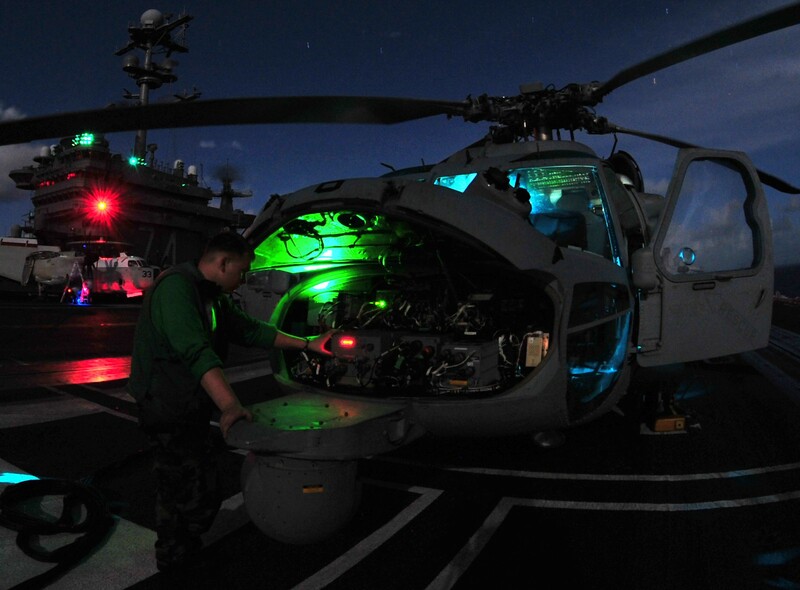 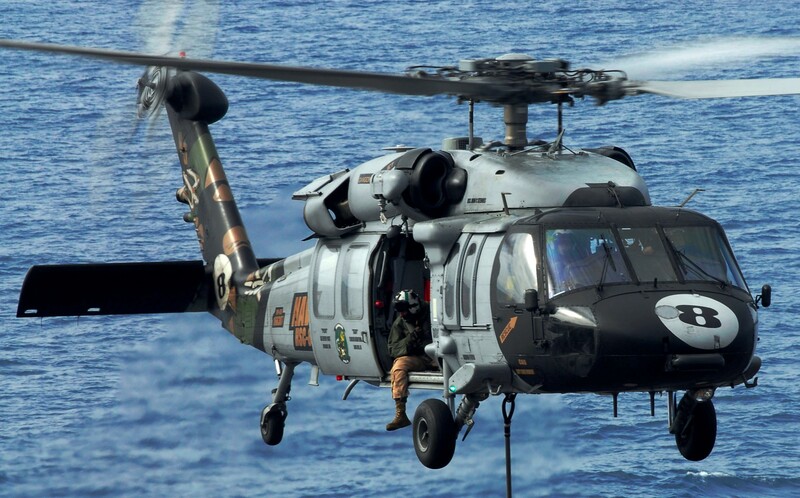 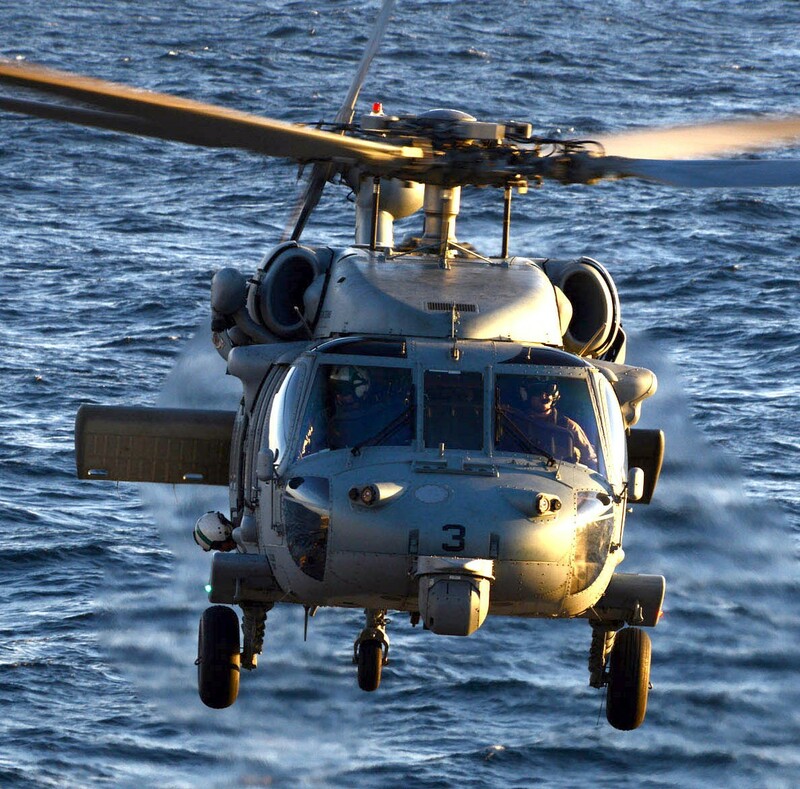 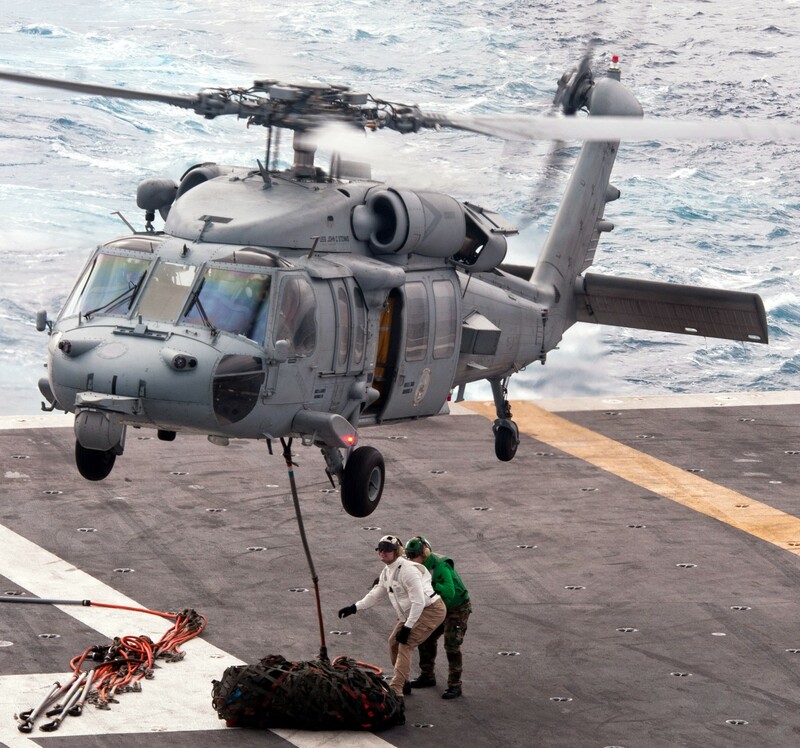 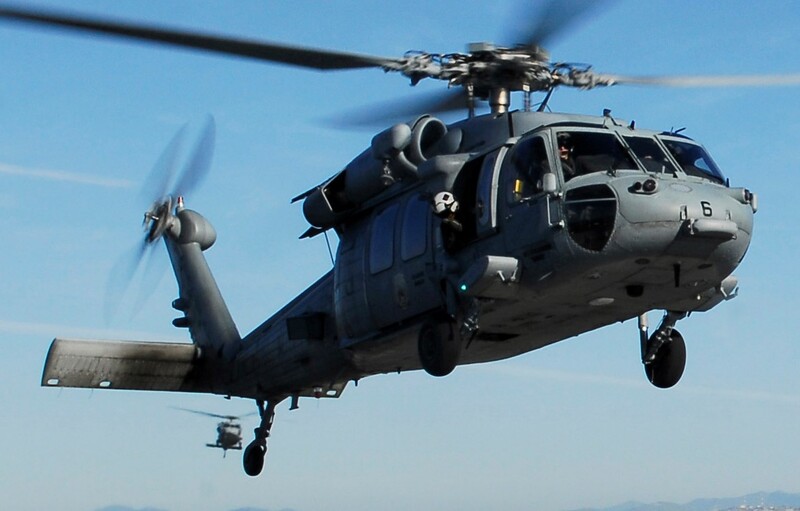 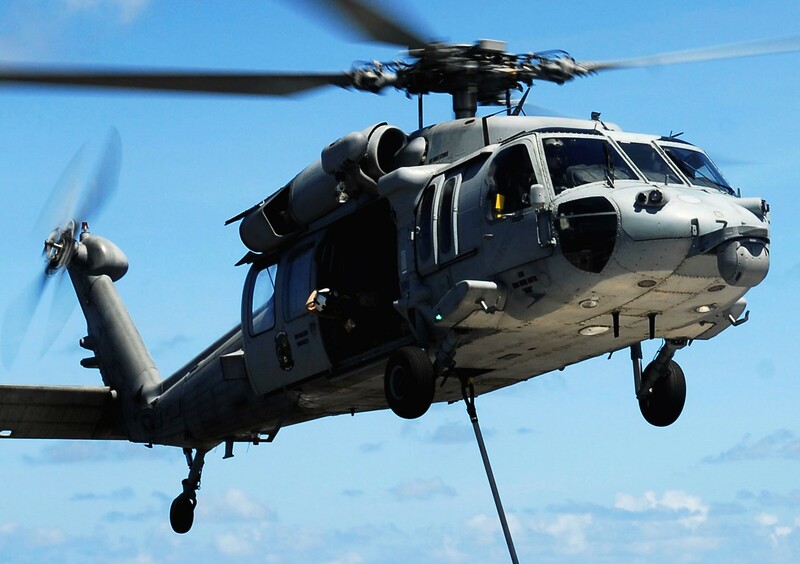 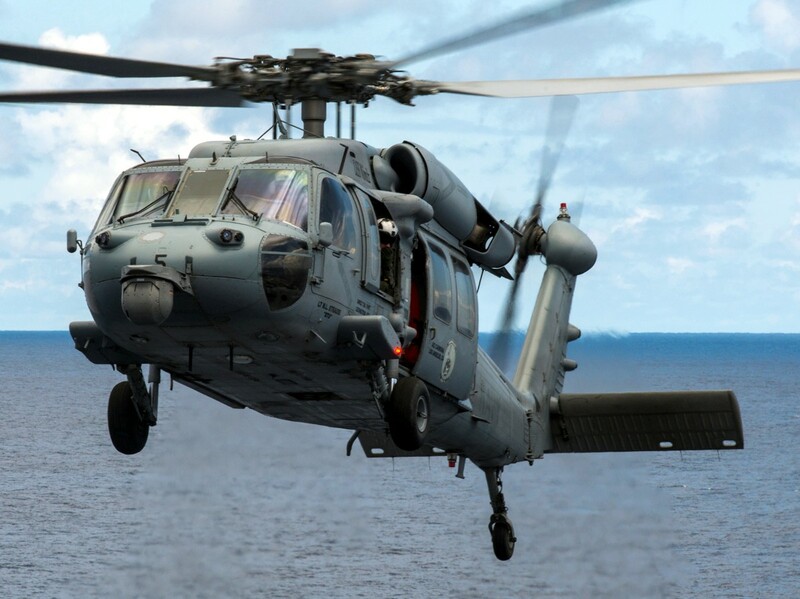 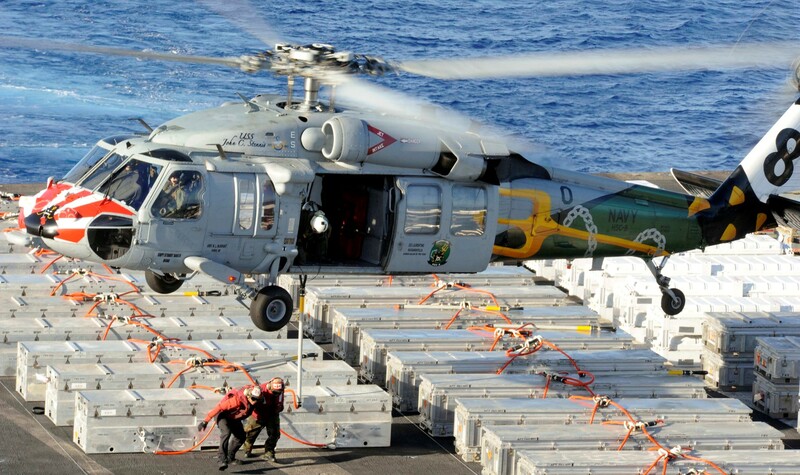 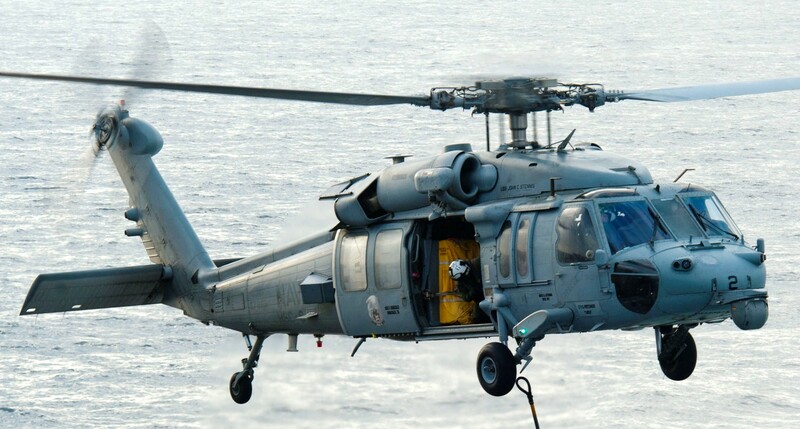 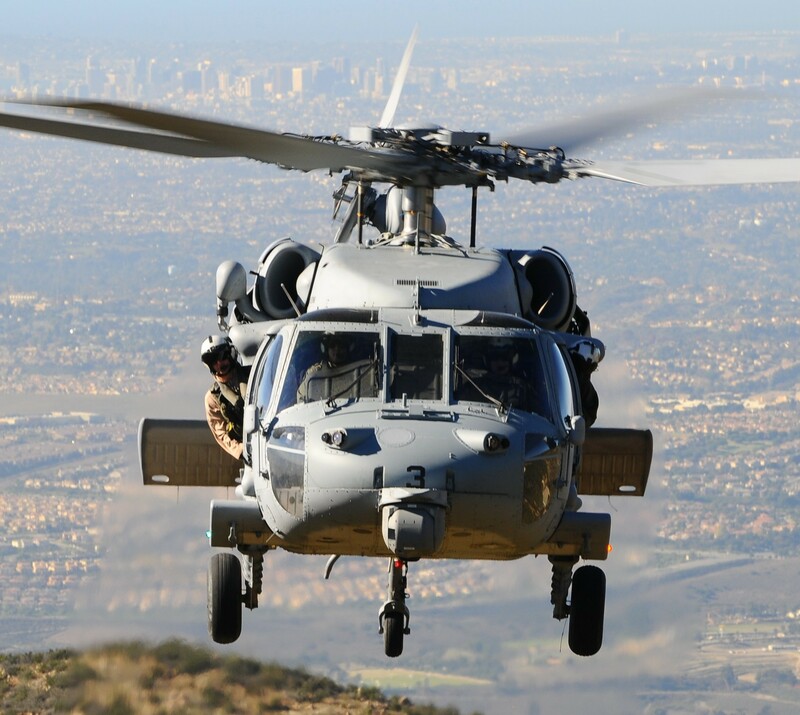 On April 2, 1993 HS-8 completed the transition from the SH-3H into the new SH-60F/HH-60H Seahawk helicopter. 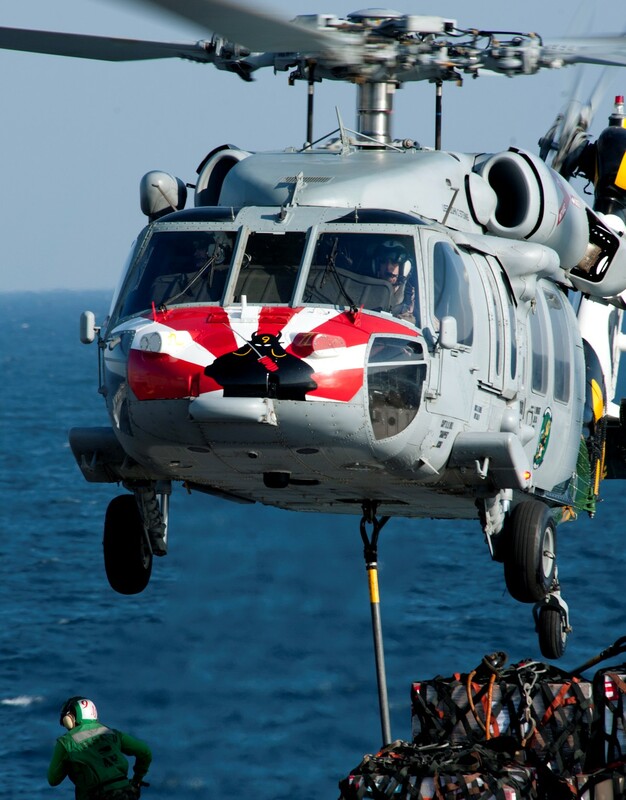 The squadron's 20th WESTPAC deployment was from February to August 1994. 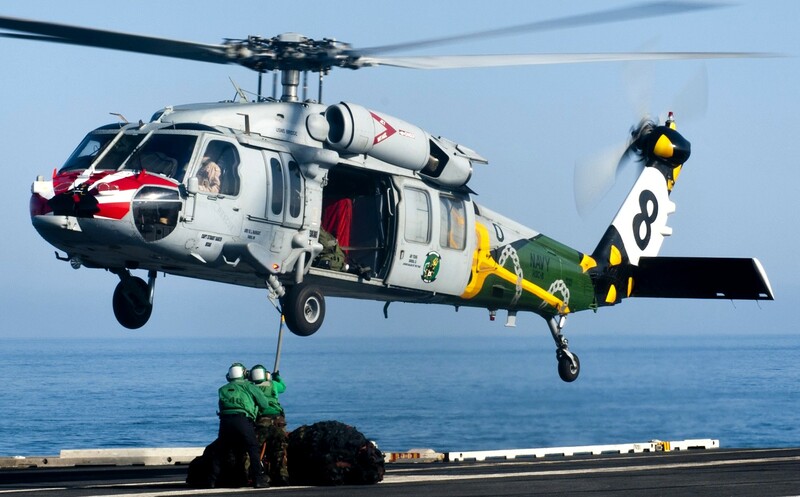 HS-8 was a member of Carrier Air Wing 14 (CVW-14) aboard the USS Carl Vinson (CVN-70). 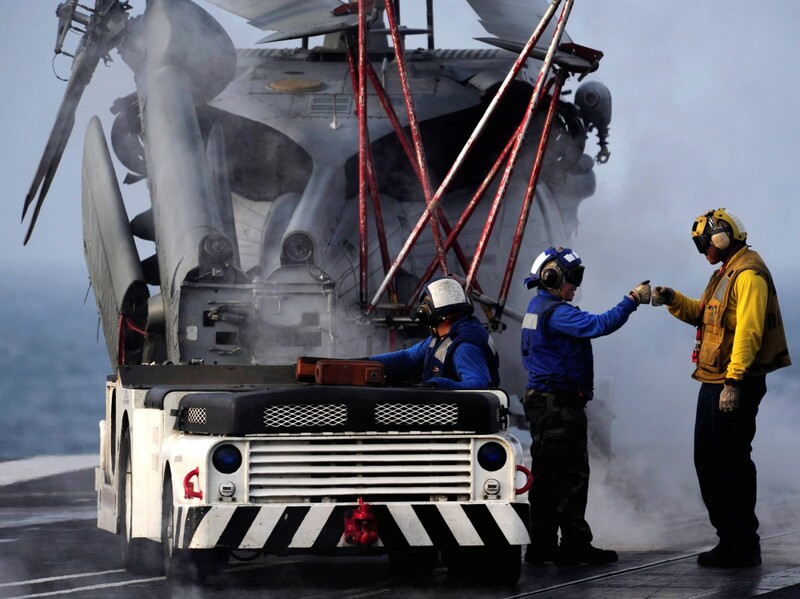 The 21st WESTPAC was concluded in May 1996 followed in September 1997 by an "Around the World Cruise" with the USS Nimitz. 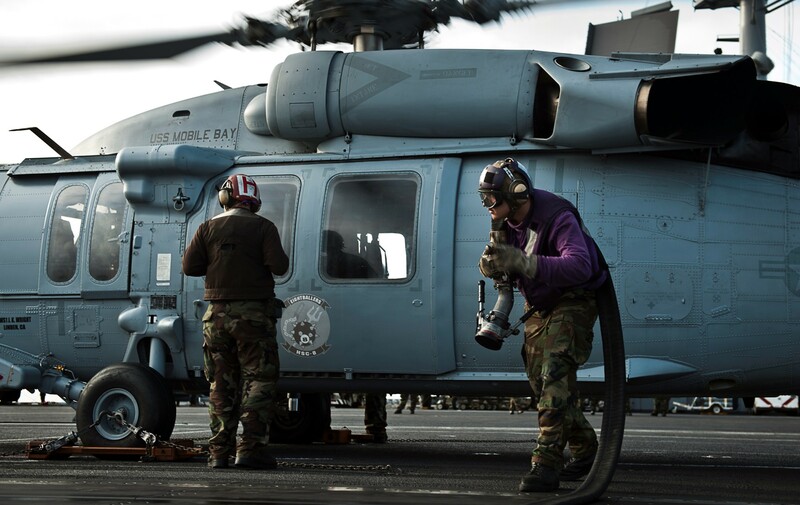 Deployments after this were routine until September 11, 2001. 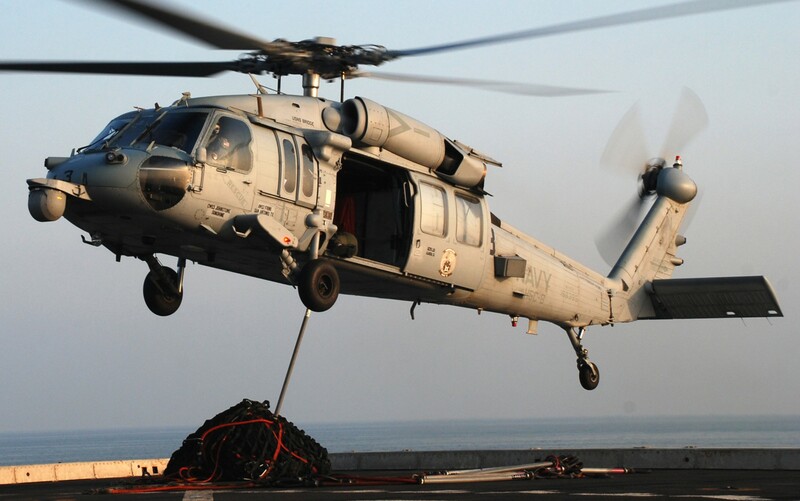 From November 2001 to May 2002 HS-8 and Carrier Air Wing Nine deployed in Operation Enduring Freedom. 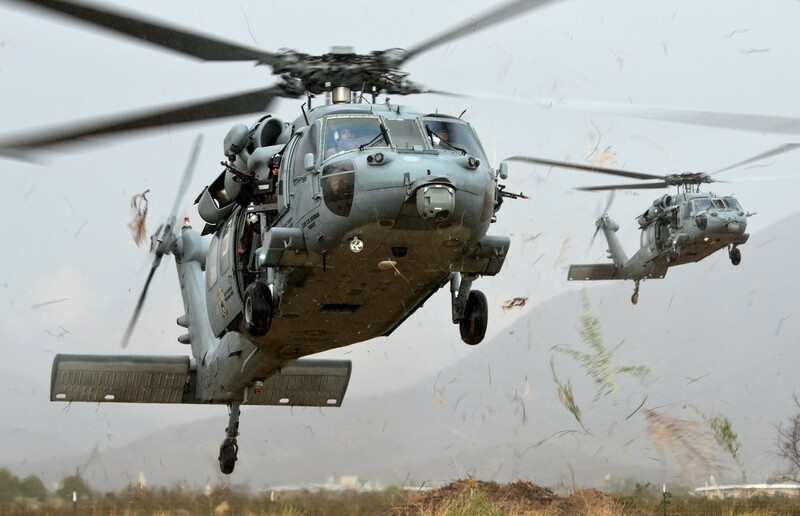 There they played a vital role in the campaign that ended with the removal of the Taliban government in Afghanistan. 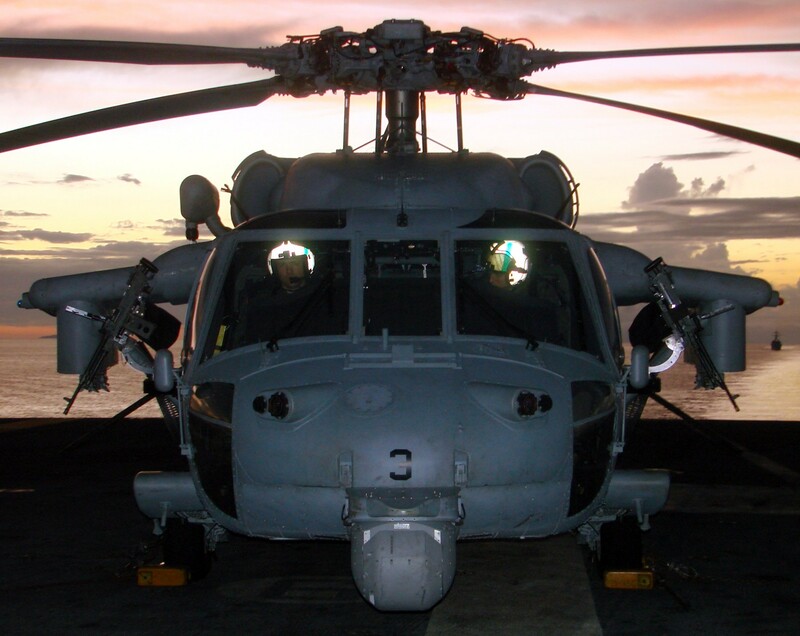 HS-8 made another WESTPAC deployment from January to September 2003 followed by their second "Around the World Cruise" from January to August of 2005 aboard the USS Carl Vinson. 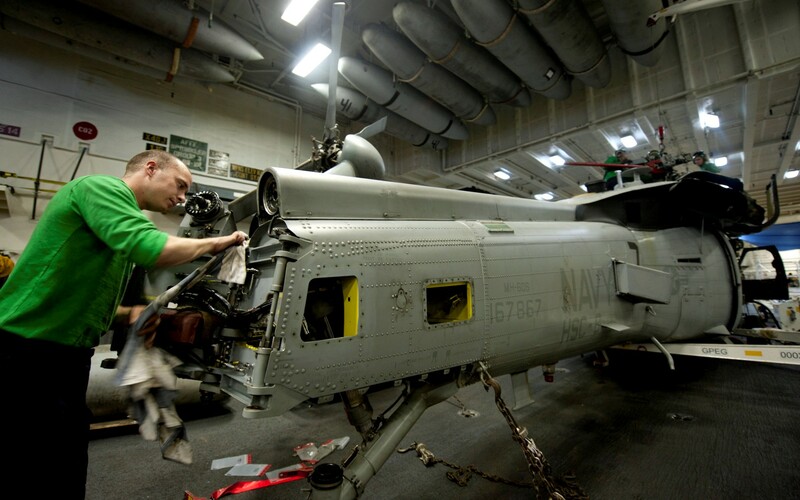 The Squadron earned the Carrier Air Wing Nine Golden Wrench Award for superior maintenance and mission completion percentages as well as the Battle E Device (Navy Battle Efficiency Award) for the 2005 World Cruise. 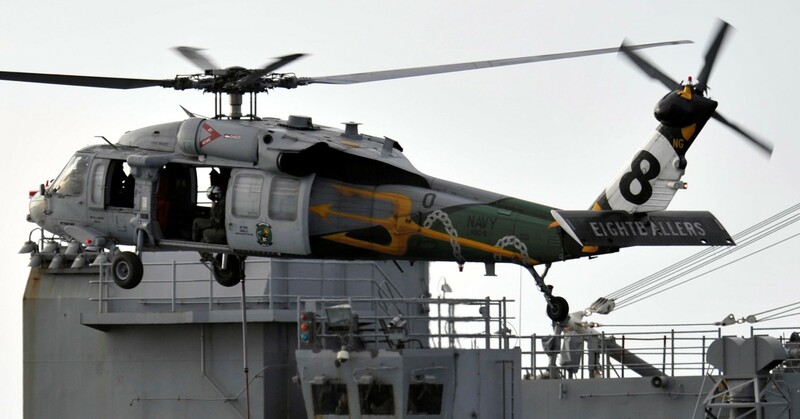 Following the 2007 deployment of HS-8 the squadron was disestablished at NAS North Island after 51 years of service. 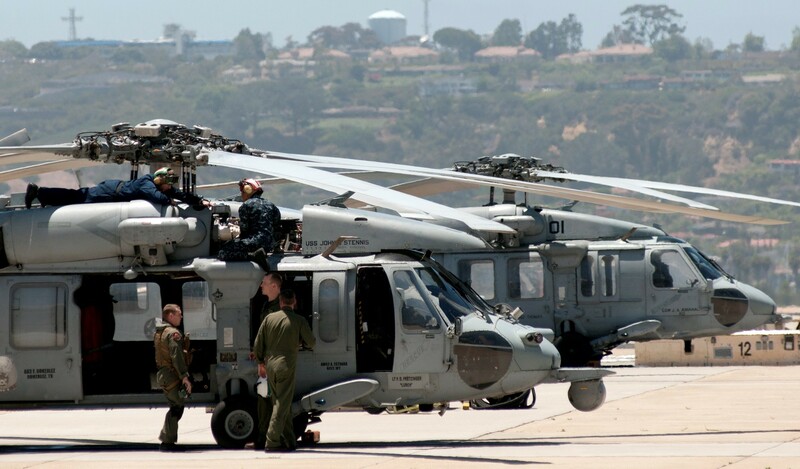 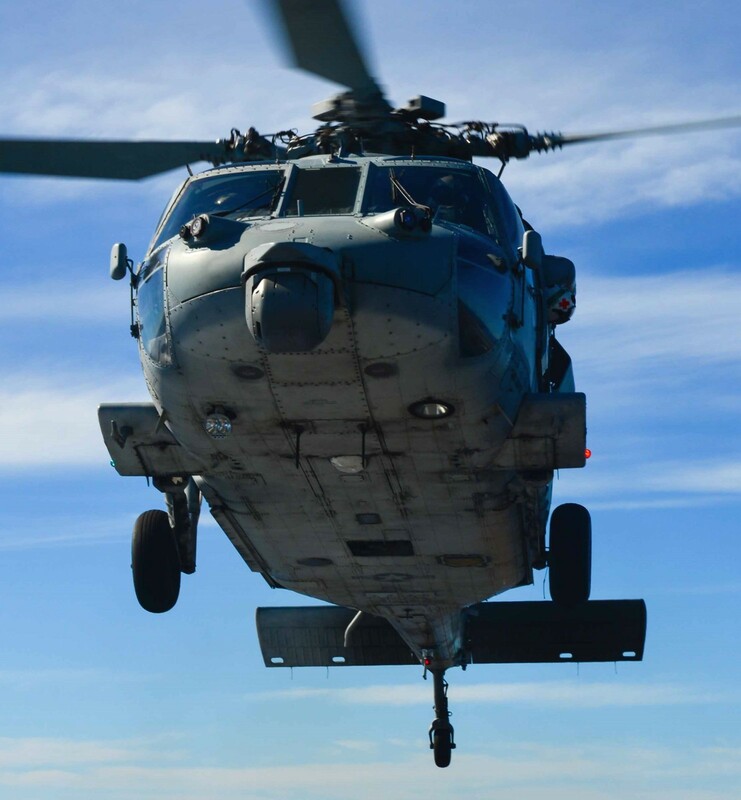 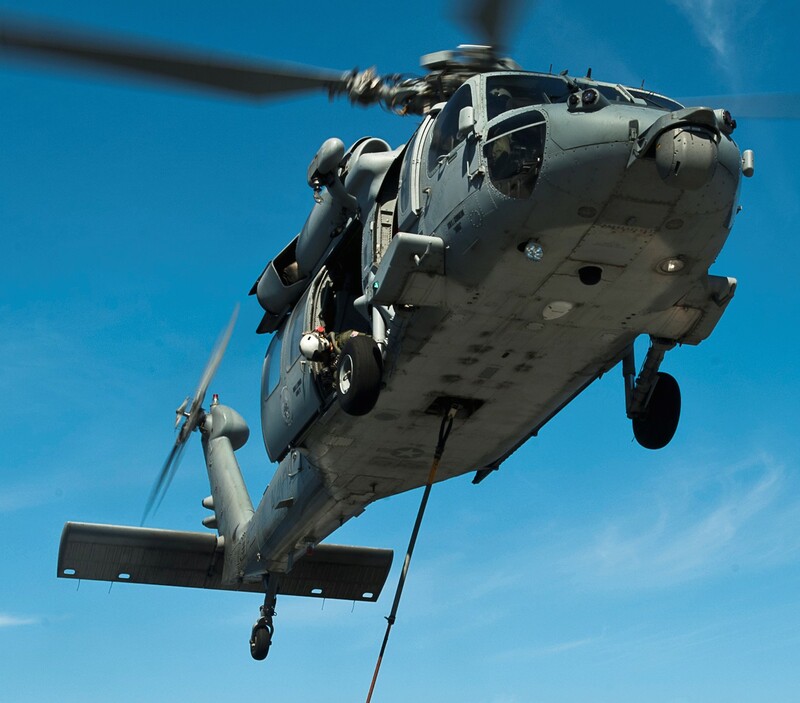 The squadron was redesignated Helicopter Sea Combat Squadron Eight on September 28, 2007 and recieved the first MH-60S Armed Helicopters. 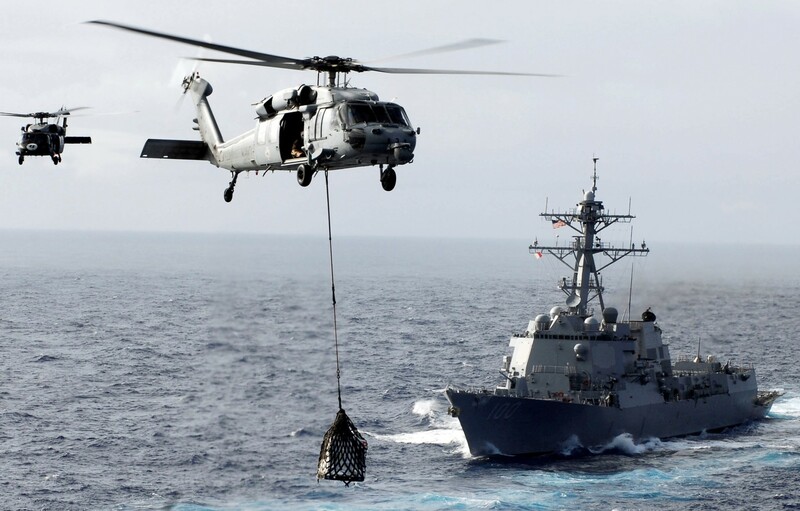 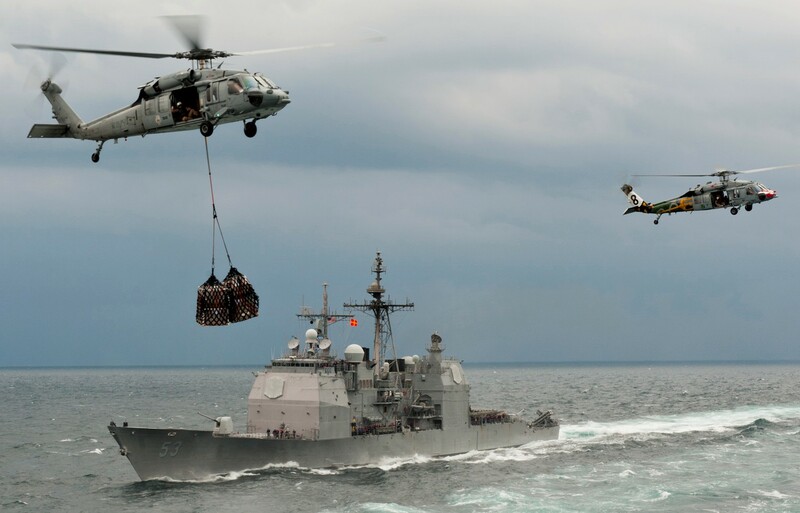 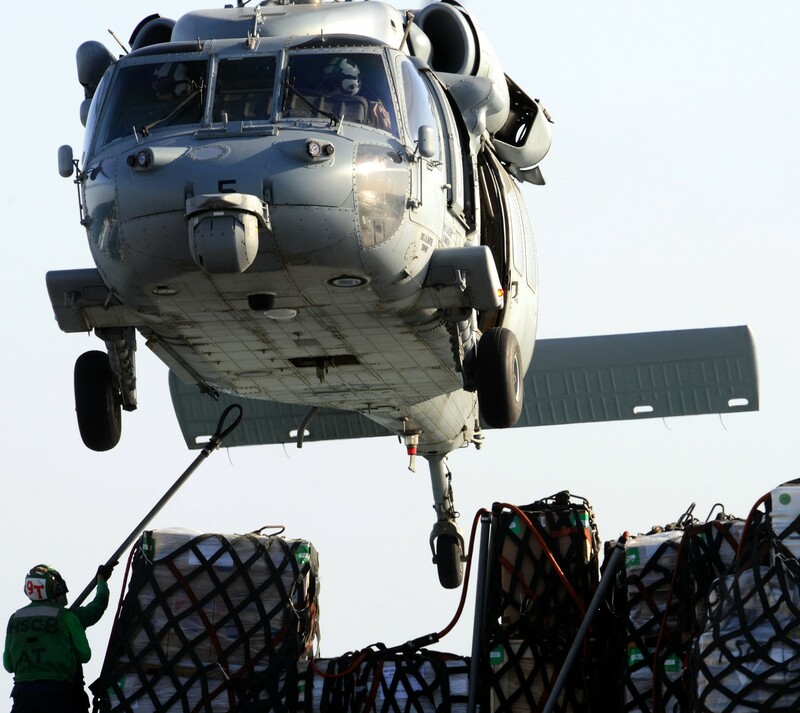 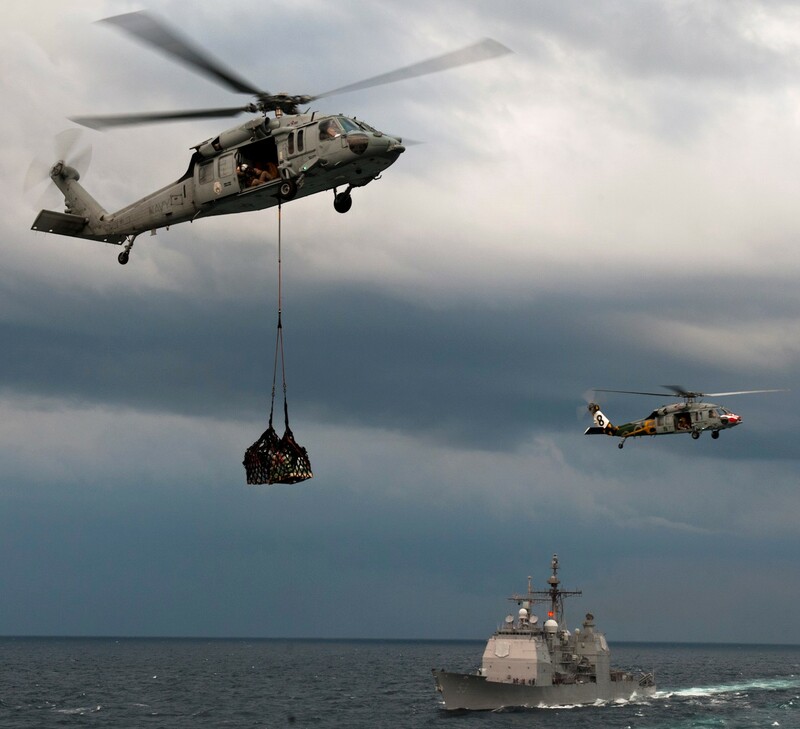 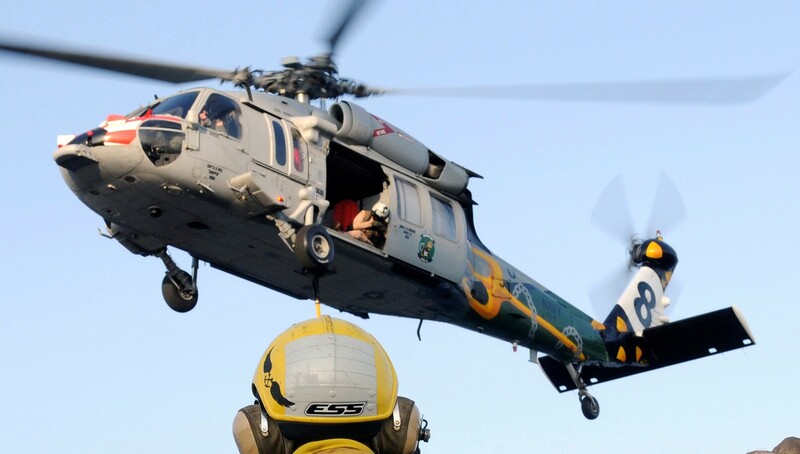 As the Navy's first Carrier-based Helicopter Sea Combat Squadron, HSC-8 immediately employed the new Armed Helicopter in highly lauded HARP and Air Wing Fallon exercises, resulting in the employment of the first MH-60S LINK 16 systems and the institution of four-gun configuration validated gun patterns in support of Strike Group Force Protection. 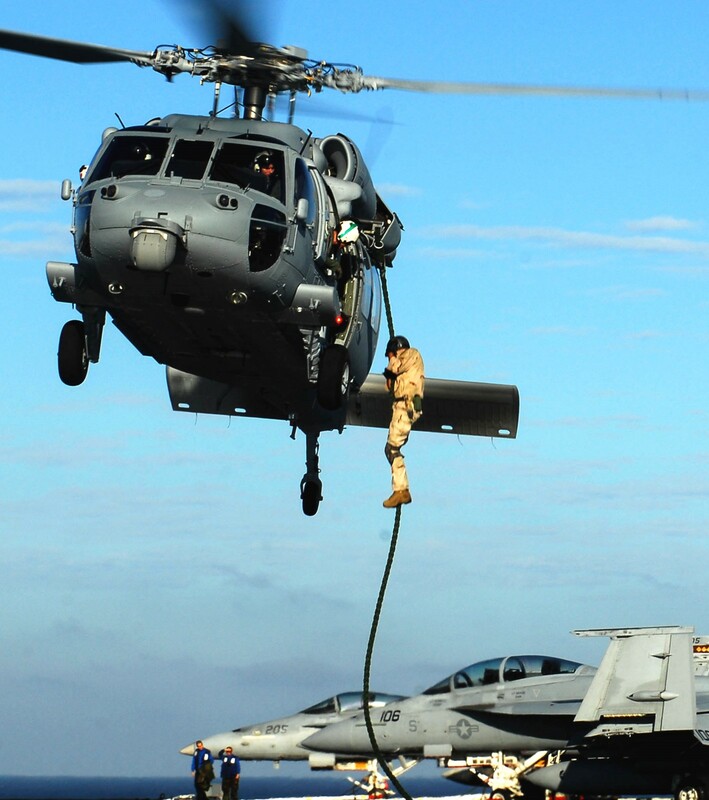 On July 6, 2009 HSC-8 returned from a ground breaking WESTPAC Cruise on board USS JOHN C. STENNIS (CVN-74) which resulted in the first ever integration between HSC and HSM squadrons operating on a single flight deck per the Helicopter Master Plan. 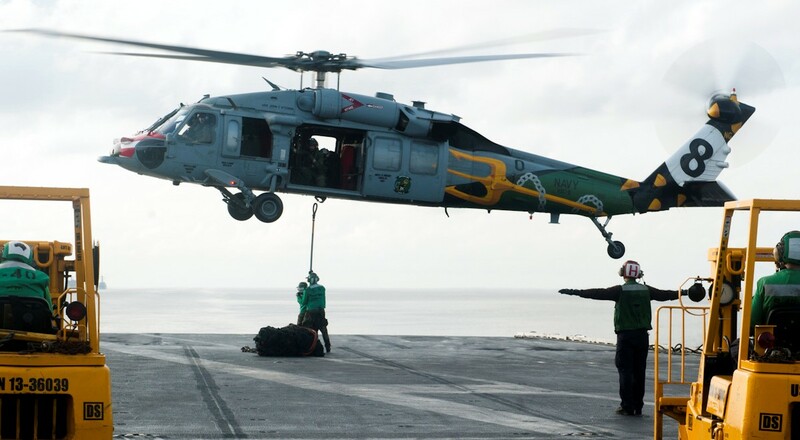 Starting the first of two back to back eight month deployment cycles, HSC-8 embarked on a WESTPAC deployment in July 2011. 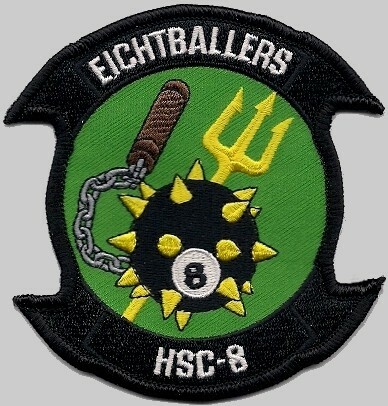 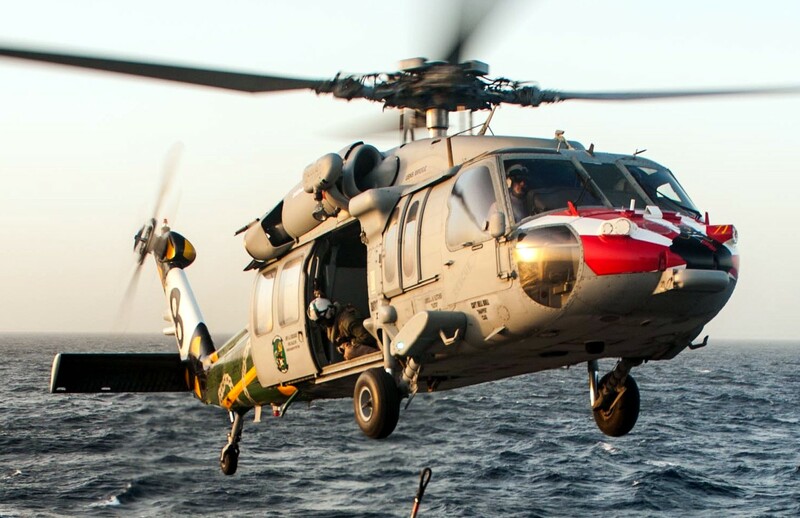 During deployment, the Eightballers accomplished the first ever MH-60S Cruiser/Destroyer (CRUDES) detachment when they embarked on USS MOBILE BAY (CG-53). 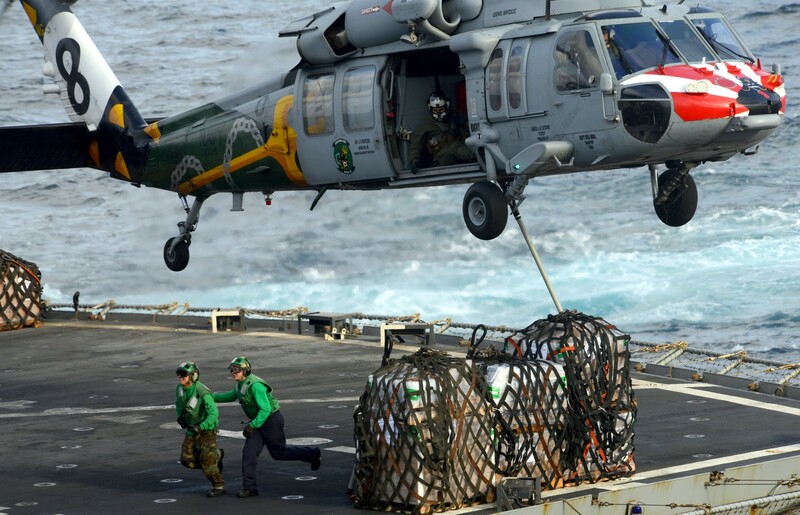 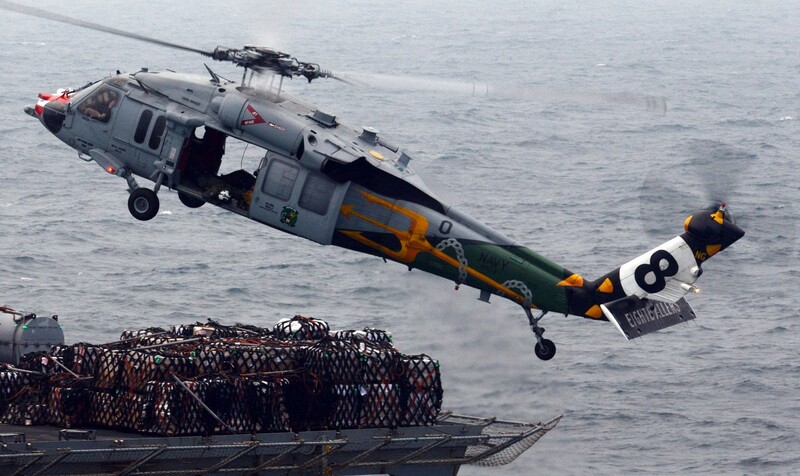 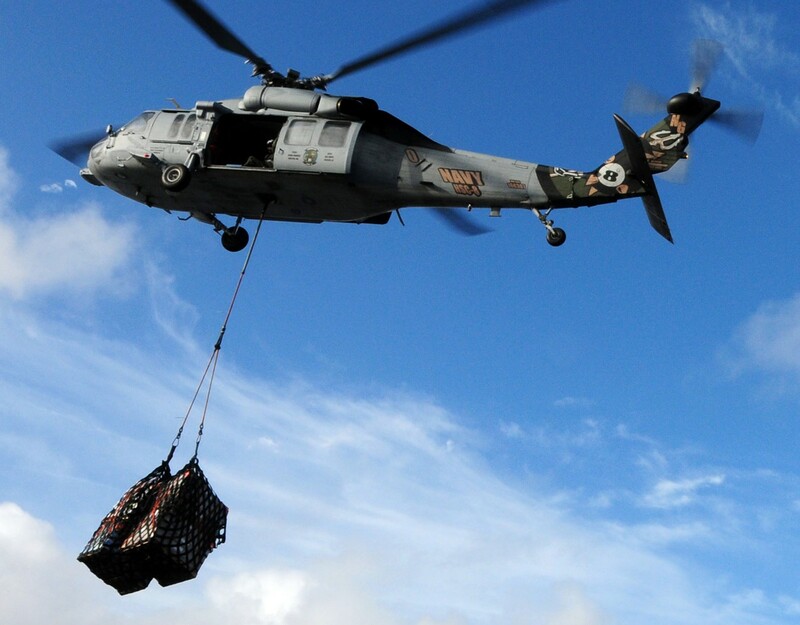 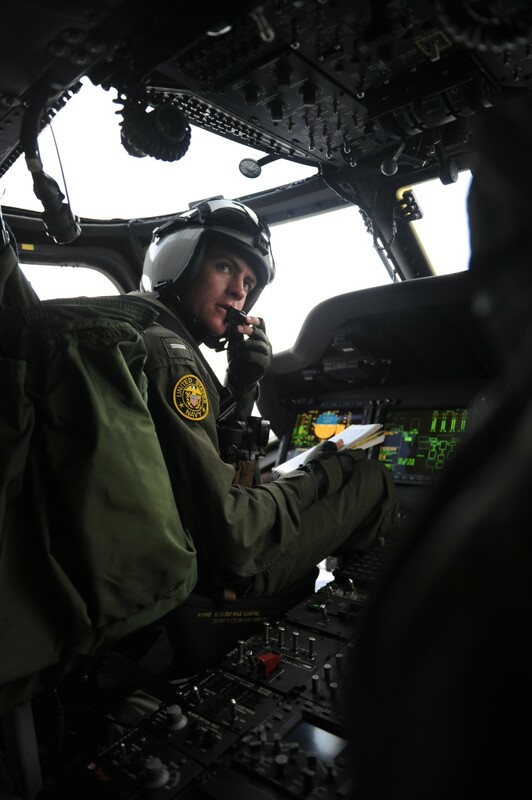 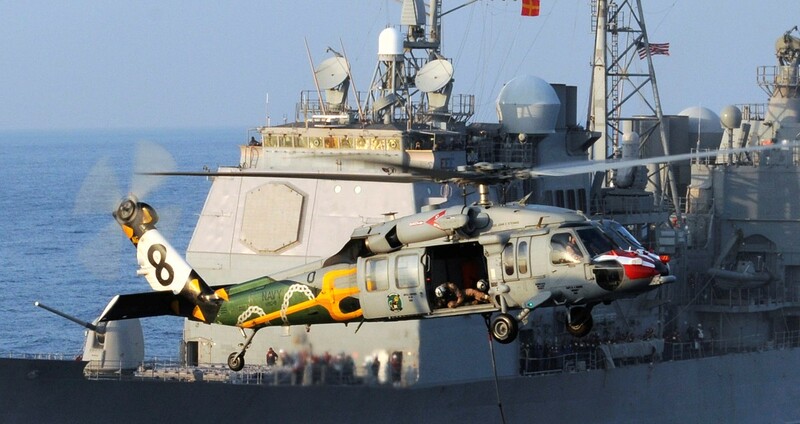 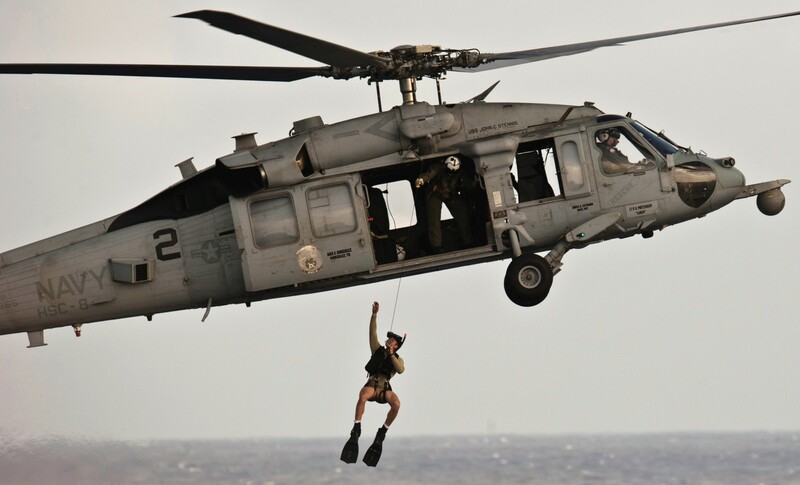 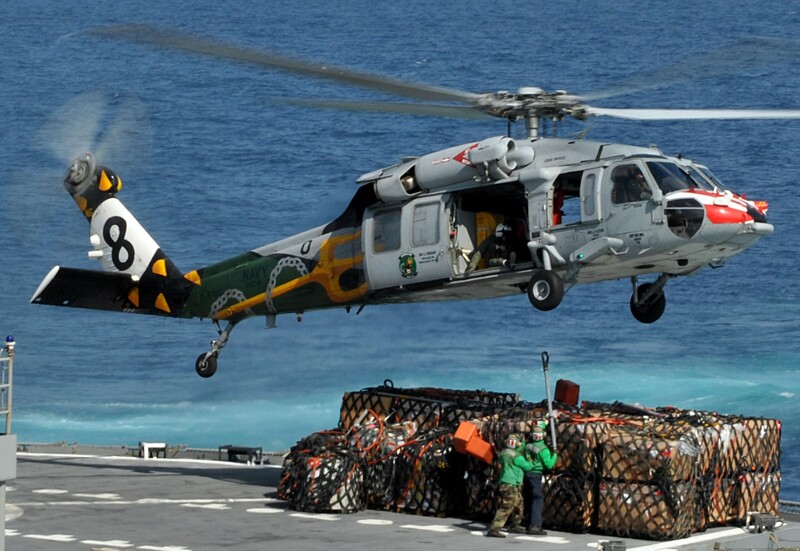 HSC-8 also assisted in counter piracy operations, successfully aiding in the capture of fifteen suspected pirates. 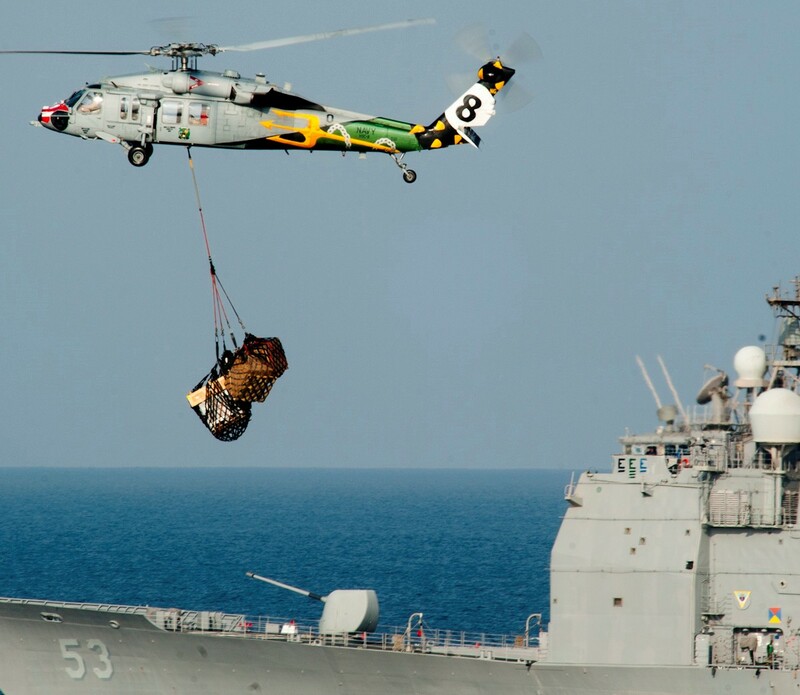 After a short turn around, HSC-8 departed on an eight-month surge deployment to the 5th Fleet Area of Responsibility in September of 2012. 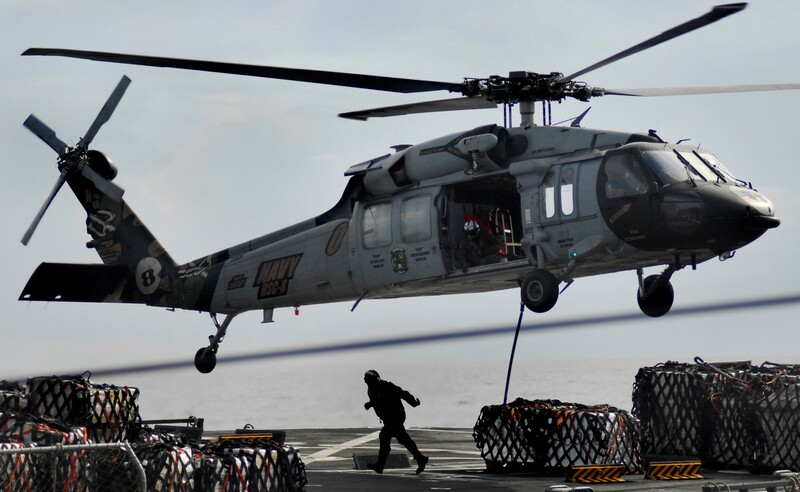 HSC-8 deployed as part of Carrier Air Wing NINE (CVW-9) aboard the USS JOHN C. STENNIS (CVN-74) in support of OPERATION ENDURING FREEDOM, maritime security operations, and theater security exercises. 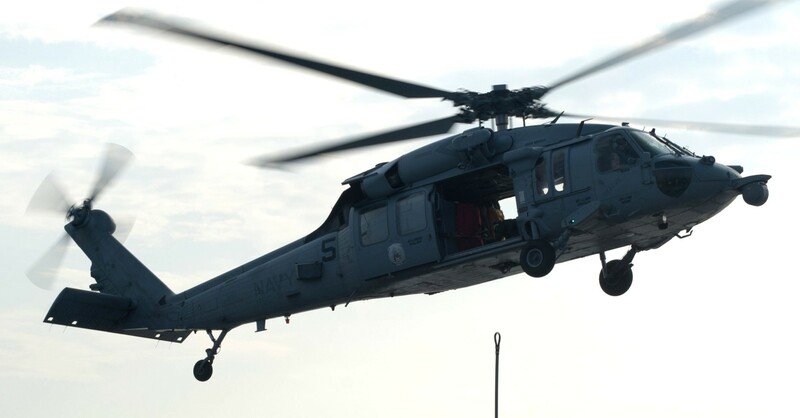 One of the highlights of the deployment was the rescue of a drowning man in the Straits of Malacca- the Eightballer’s first overwater rescue in several years. 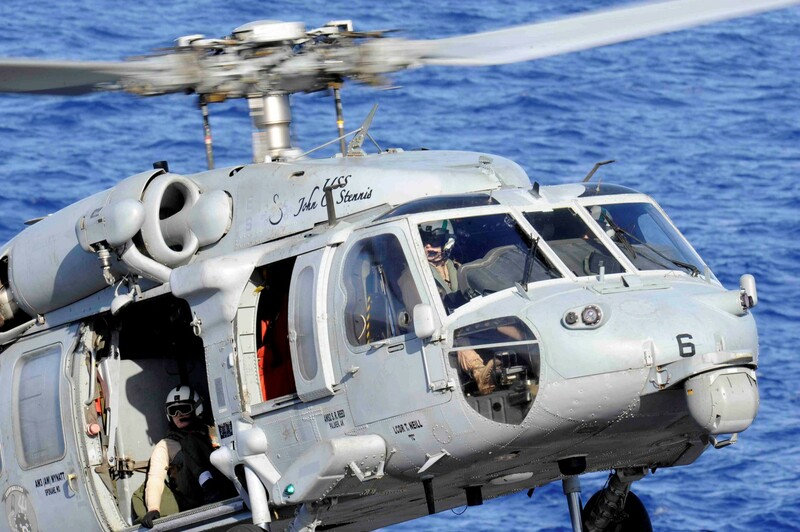 HSC-8 also participated in OPERATION BEACON FLASH, a joint security exercise with the Royal Omani Air Force.